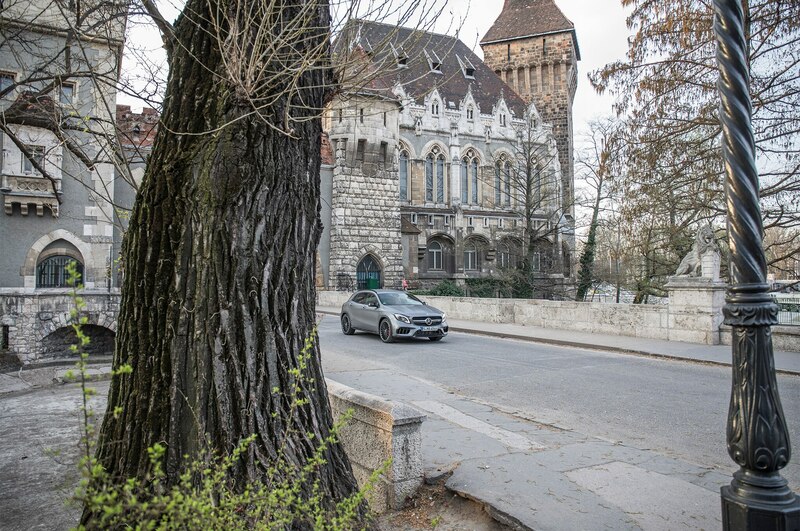 BUDAPEST, Hungary — If the future of BMW’s small cars is in doubt, the same cannot be said for Mercedes-Benz’s foray into front-wheel-drive-based compacts. 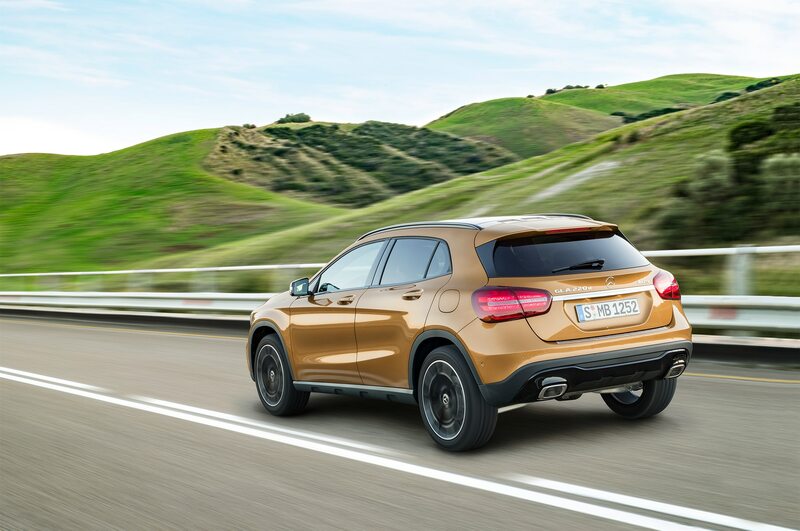 Mercedes has long attempted a viable mainstream, entry-premium urban vehicle lineup capable of drawing in youthful consumers. 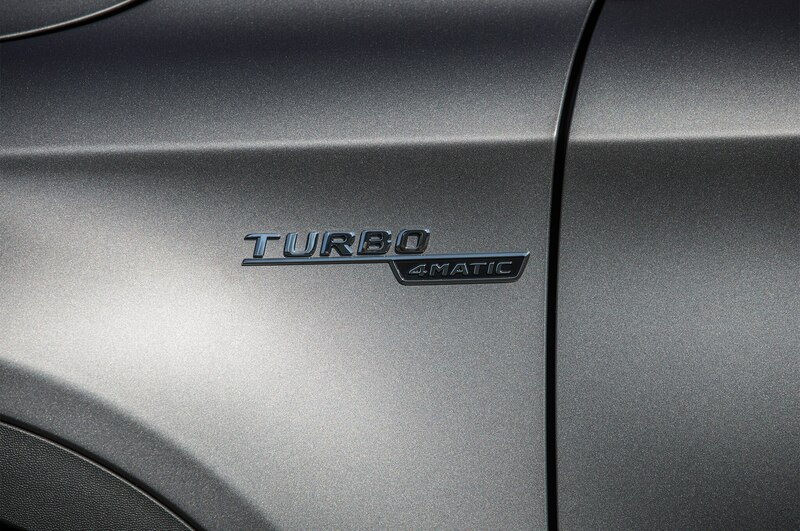 That’s why it once owned Chrysler. 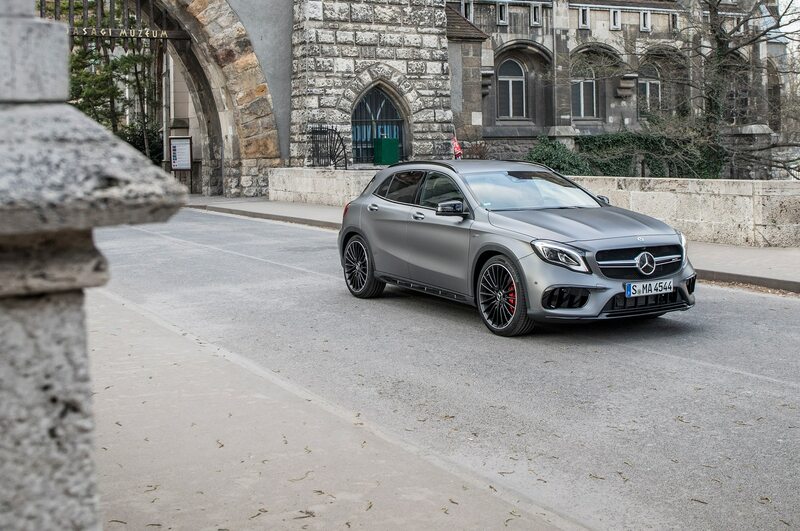 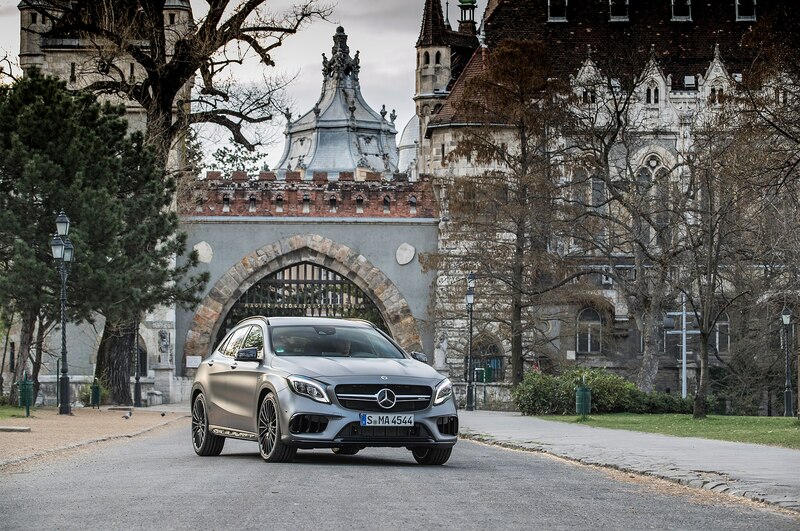 Now it’s the GLA-Class, CLA-Class, and B250e in the U.S., plus the A-Class and CLA-Class Shooting Brake elsewhere. 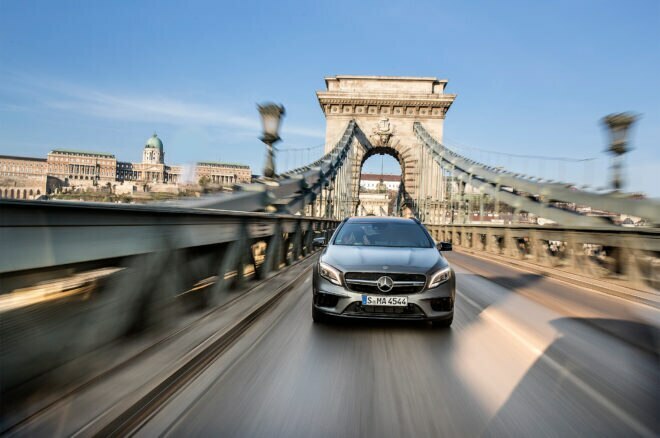 Though they lack the substance and sumptuous luxury of traditional, rear-wheel-drive-based Mercedes, they have a future tackling emissions regulations, urban driving restrictions and ride-sharing programs. 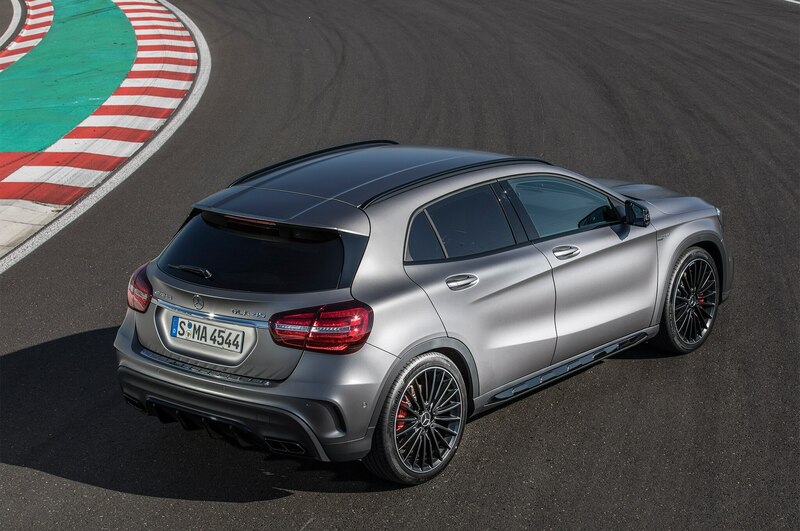 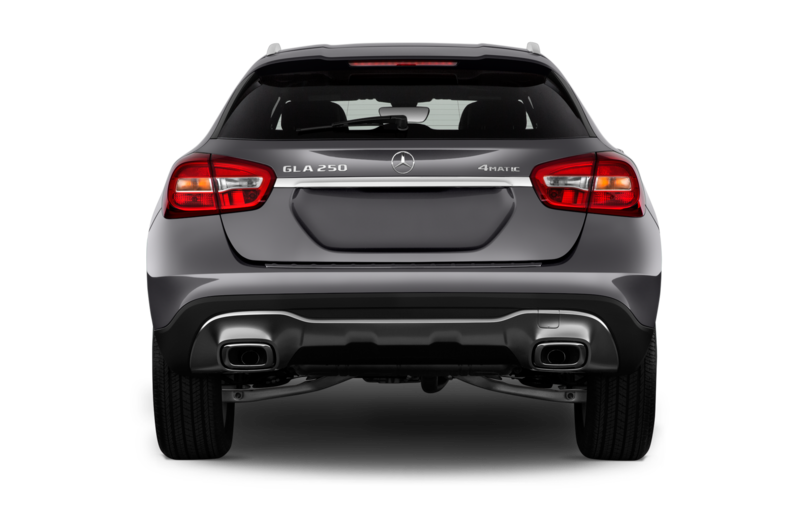 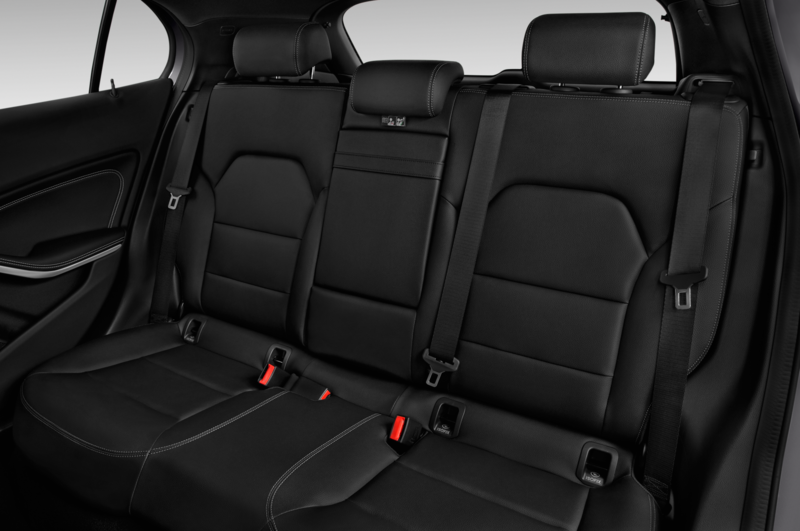 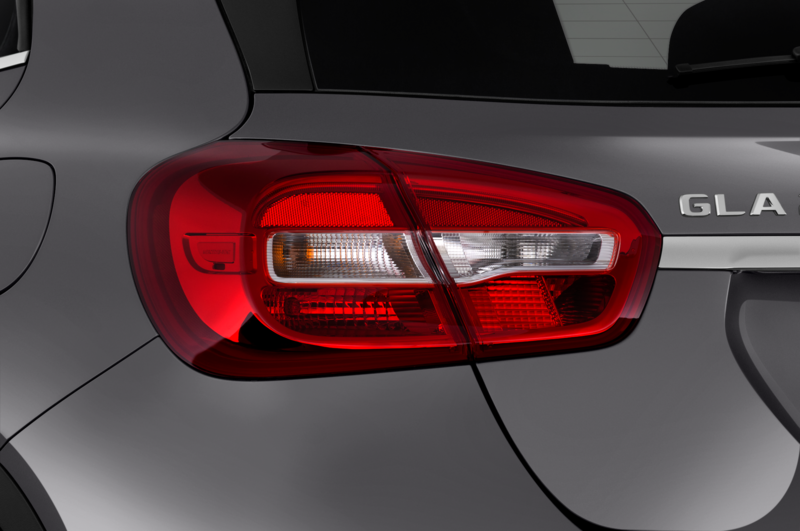 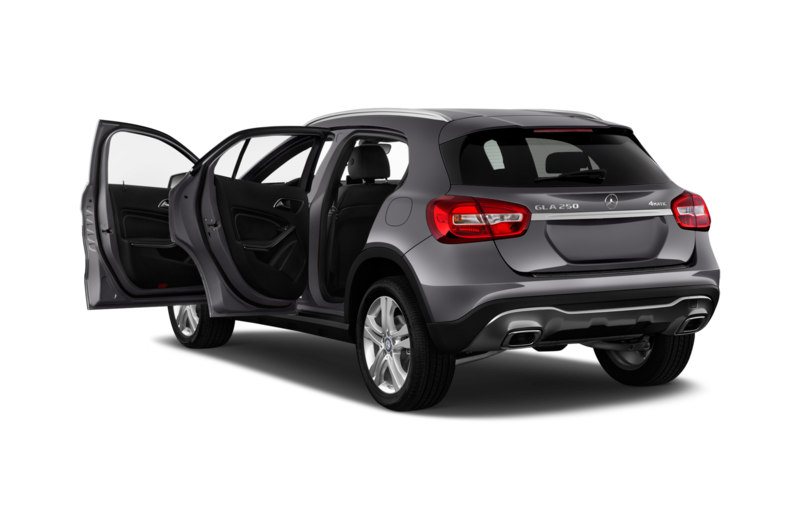 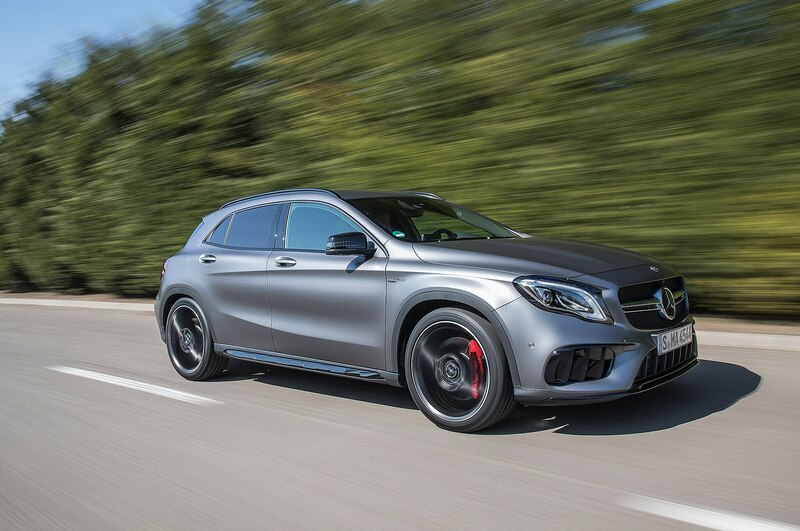 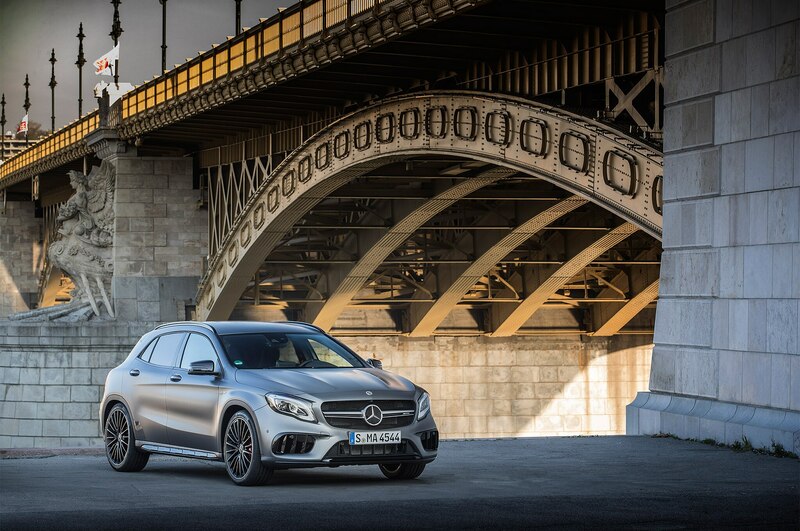 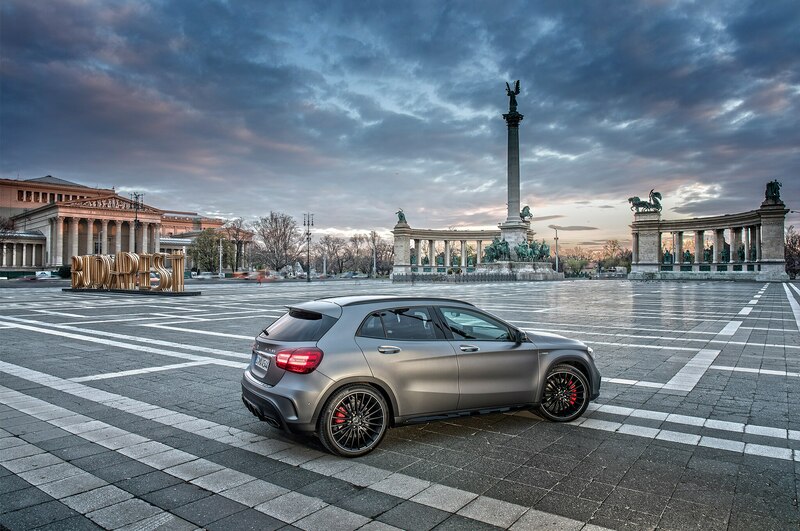 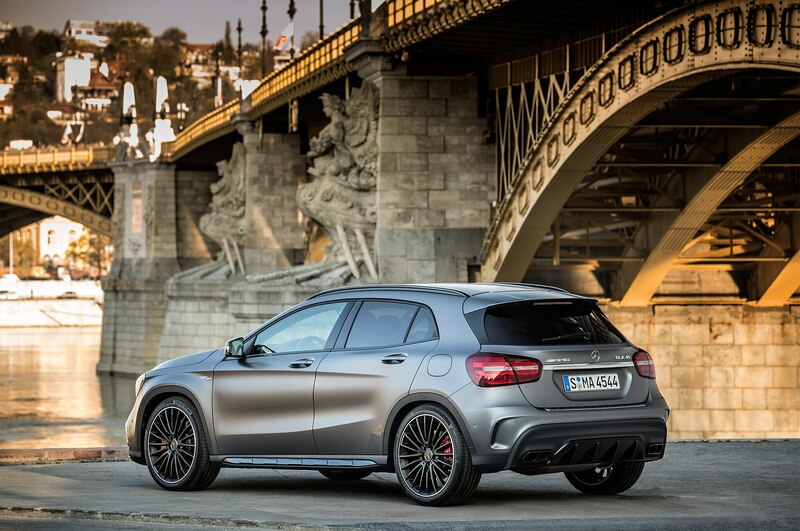 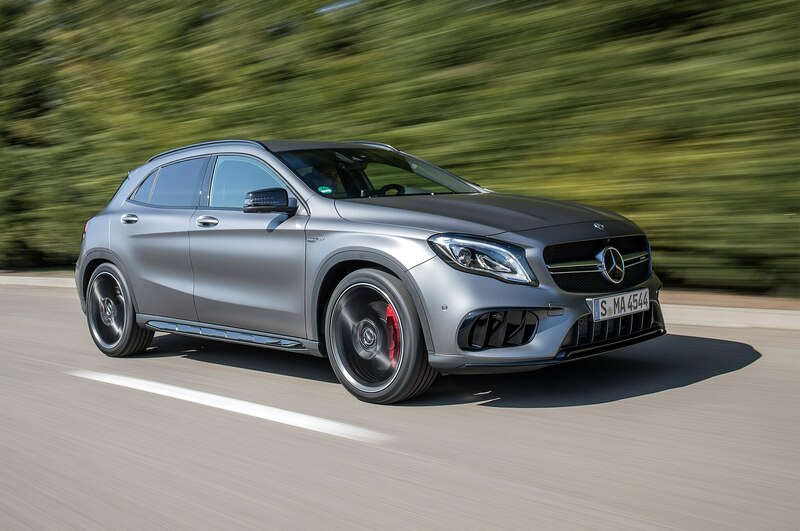 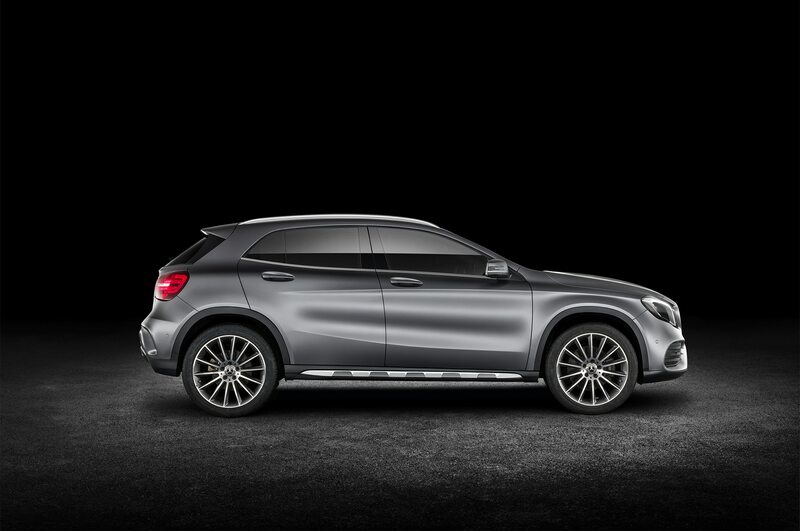 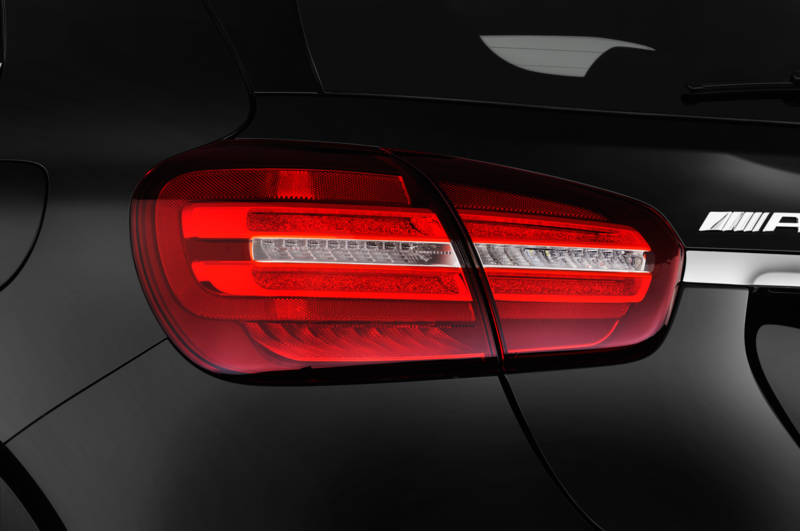 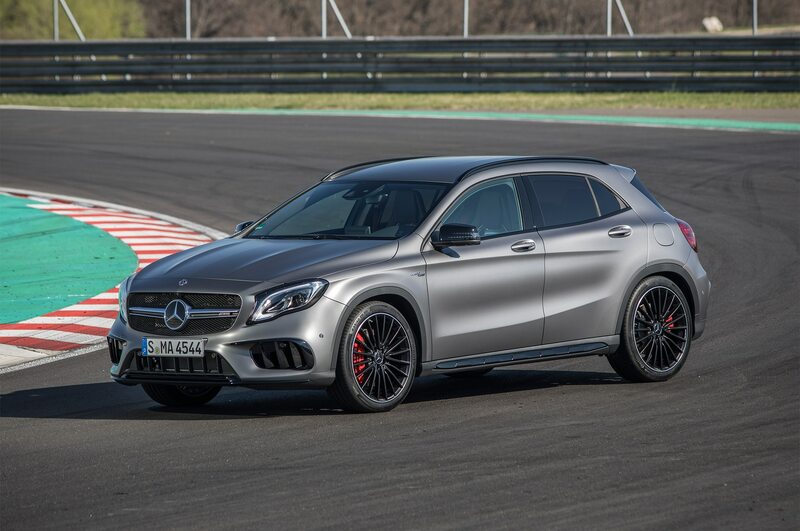 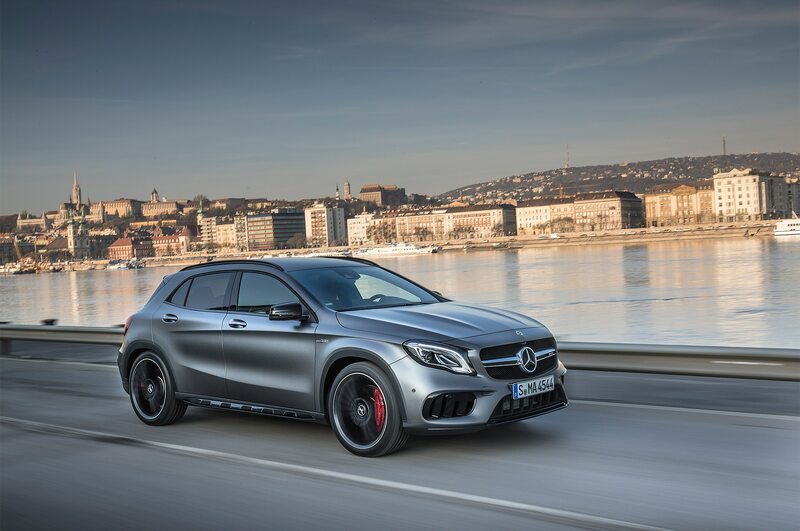 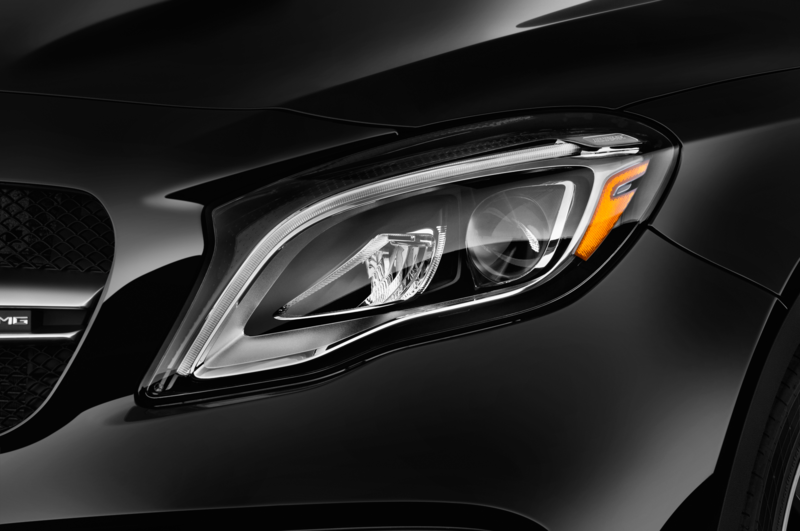 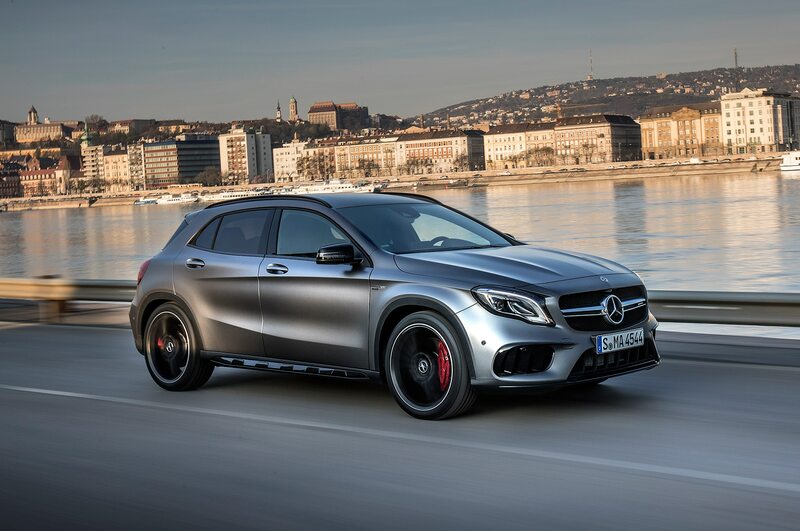 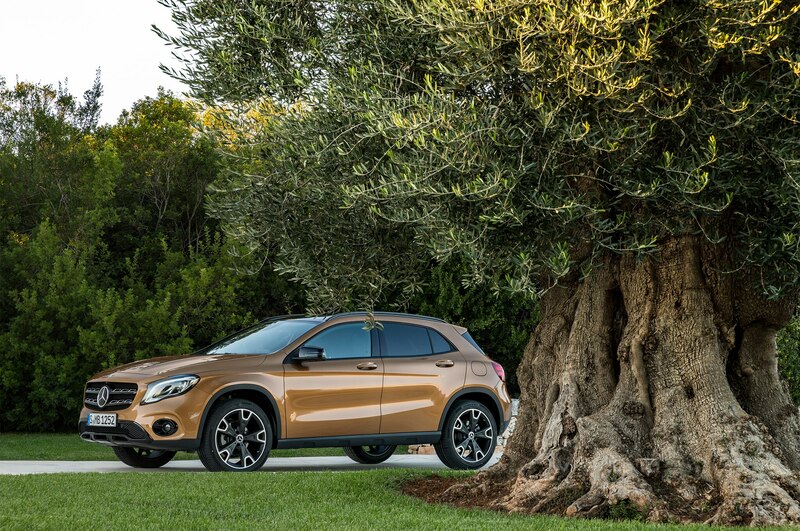 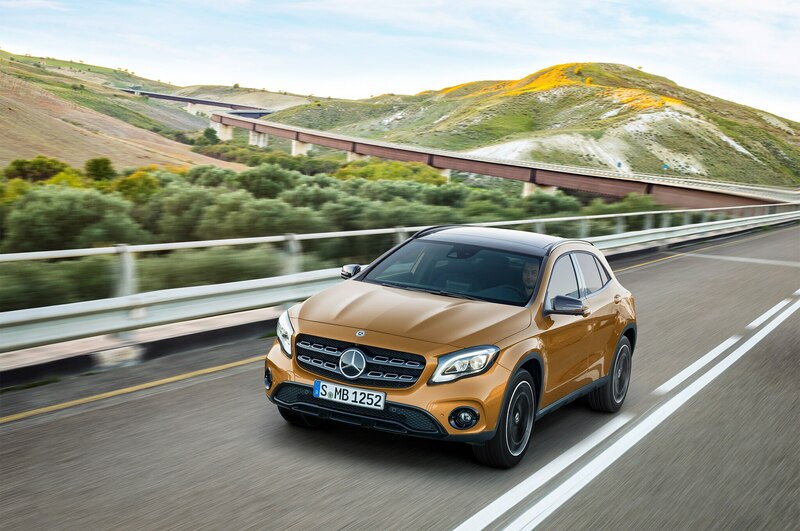 The Mercedes-Benz GLA-Class leads the U.S. lineup, starting with the $34,324 FWD GLA250. 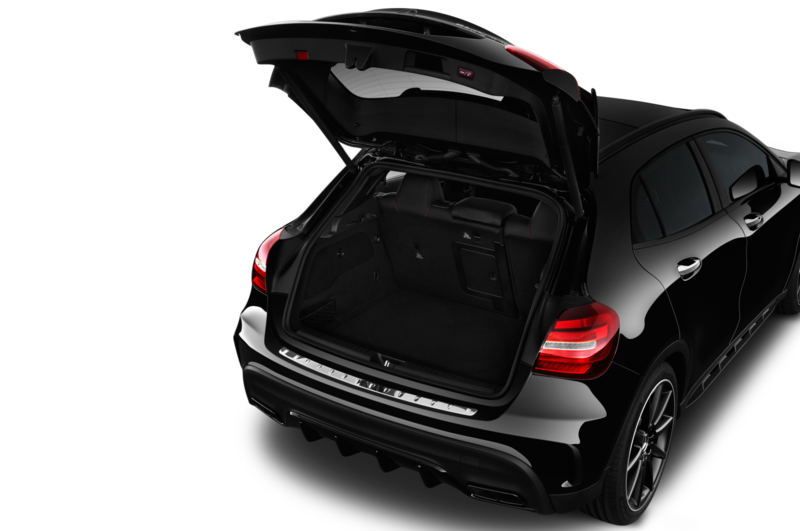 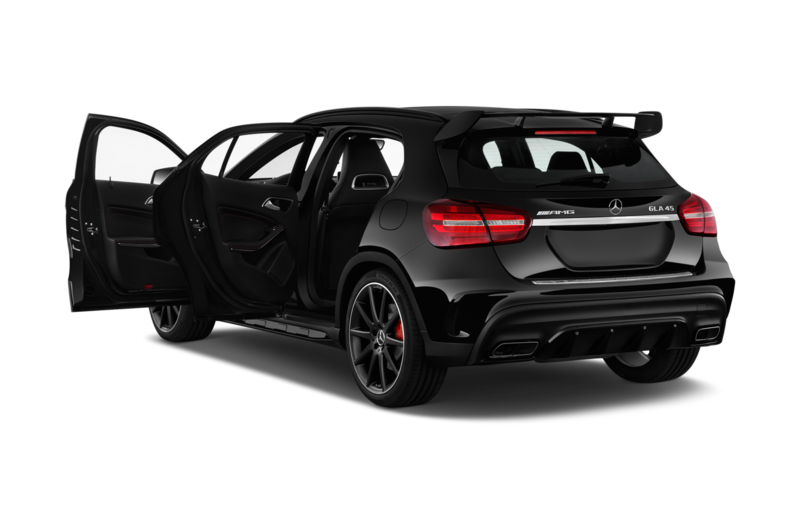 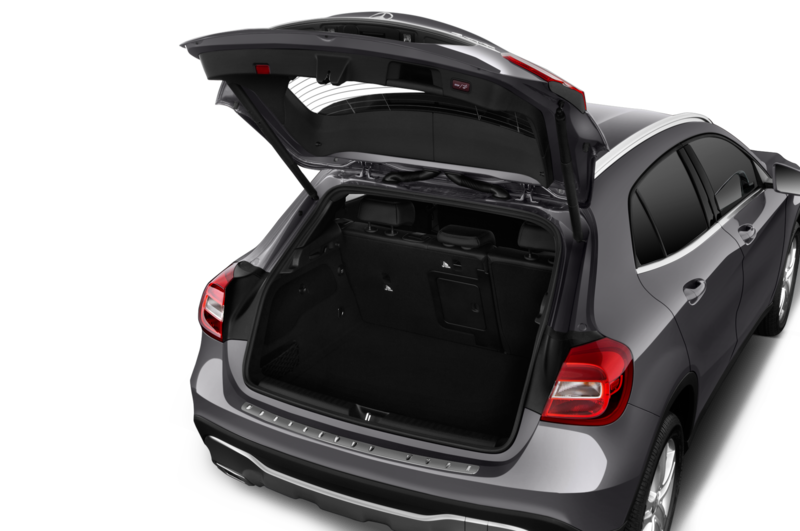 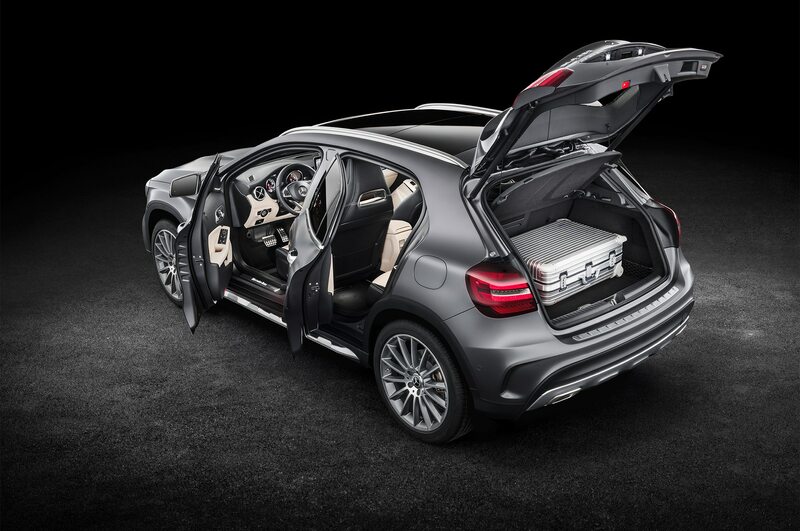 It’s a tall crossover/utility vehicle with space for four and their luggage, and it’s just $1,000 more expensive than the one-year sales wonder CLA-Class four-door “sport coupe.” Move on up to the 375-horsepower turbo-four-powered Mercedes-AMG GLA45 and the difference to its CLA45 counterpart shrinks to just $610. 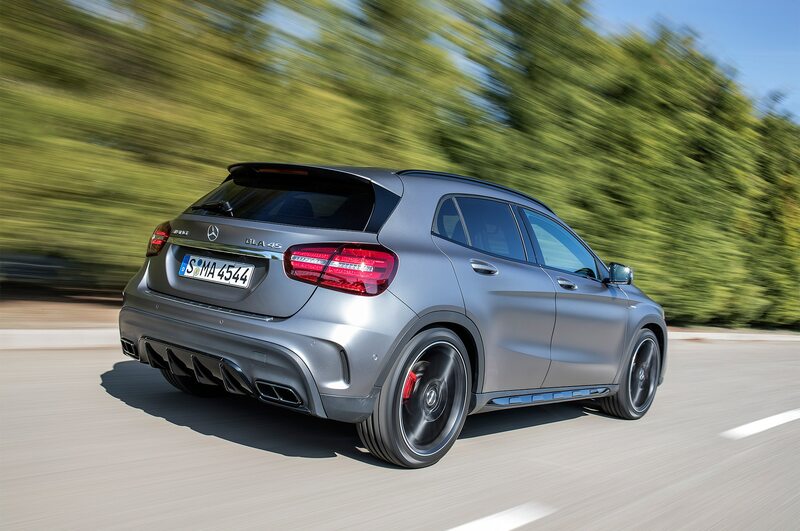 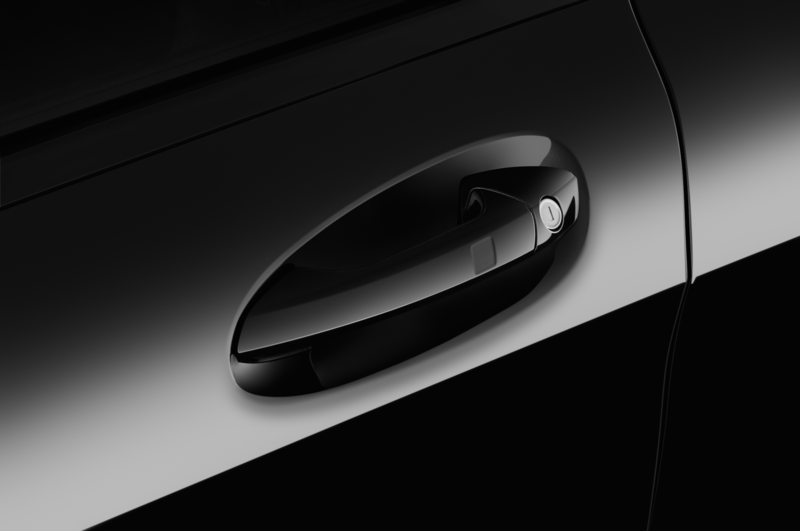 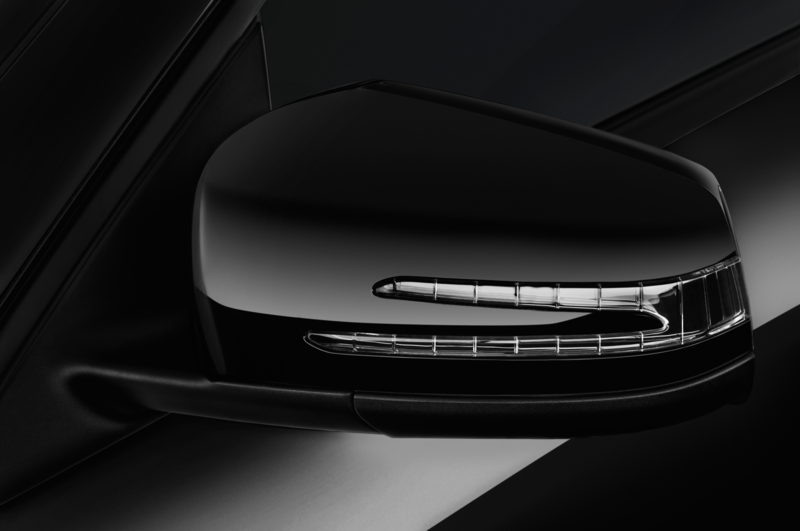 It receives a facelift for the coming model year. 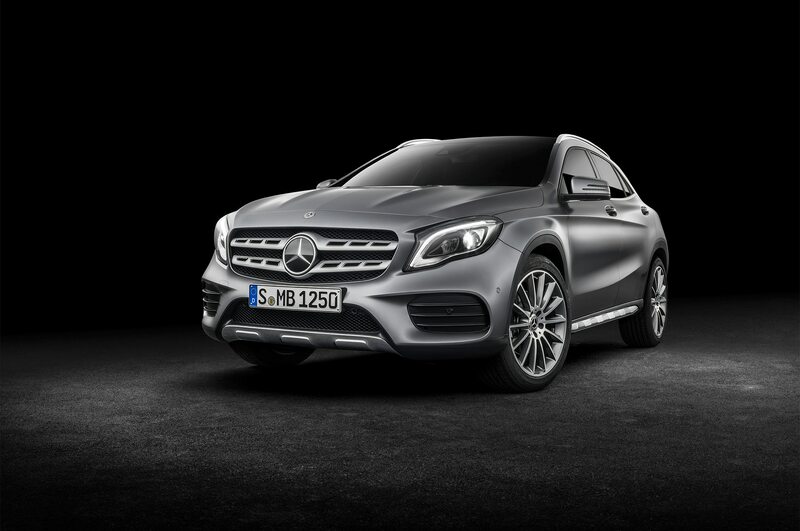 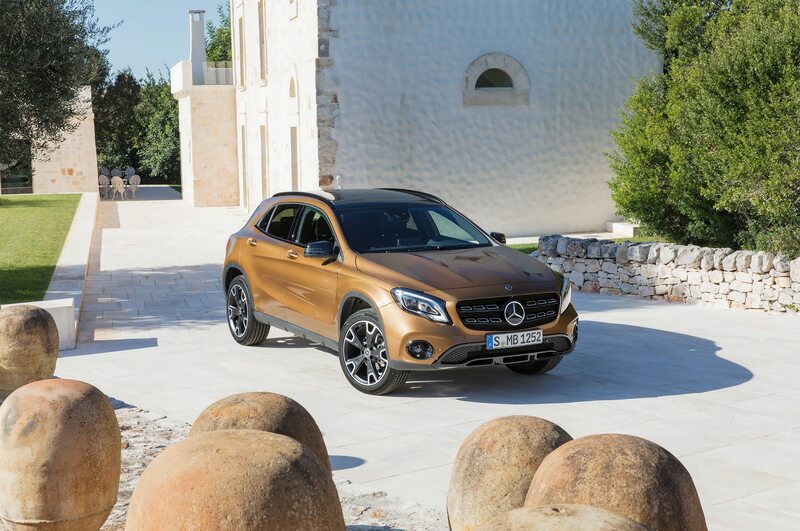 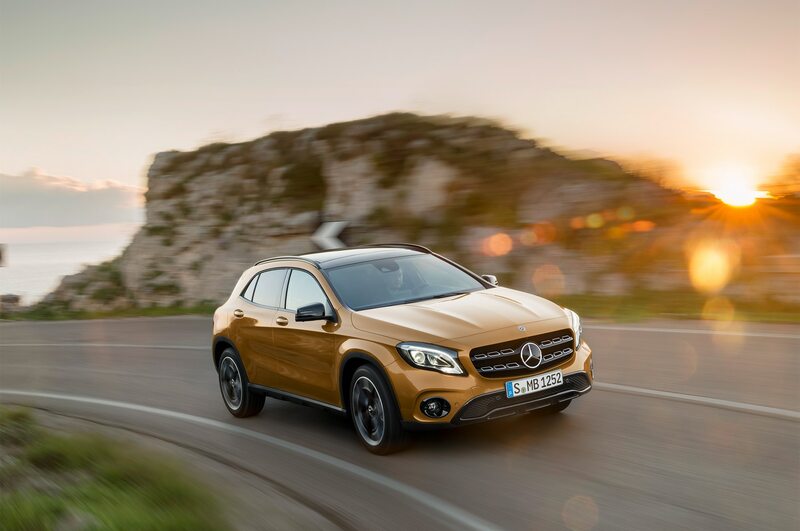 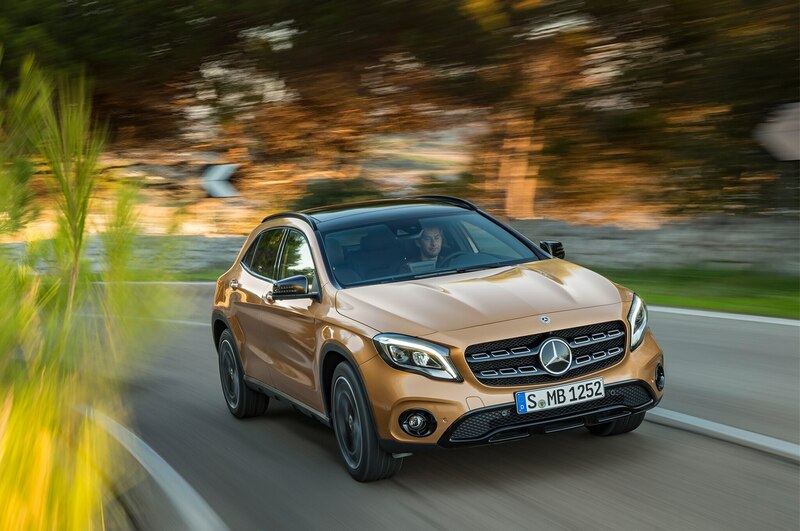 The 2018 Mercedes-Benz GLA-Class gets cleaner-looking, redesigned front and rear bumpers, new 18- and 19-inch wheel designs, and LED headlamps replacing Bi-Xenons. 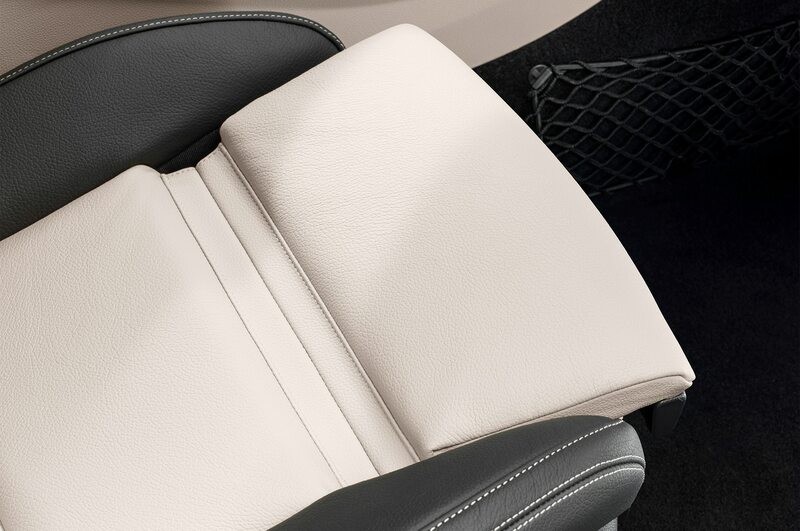 There’s also a rather tasty new Canyon Beige paint color option. 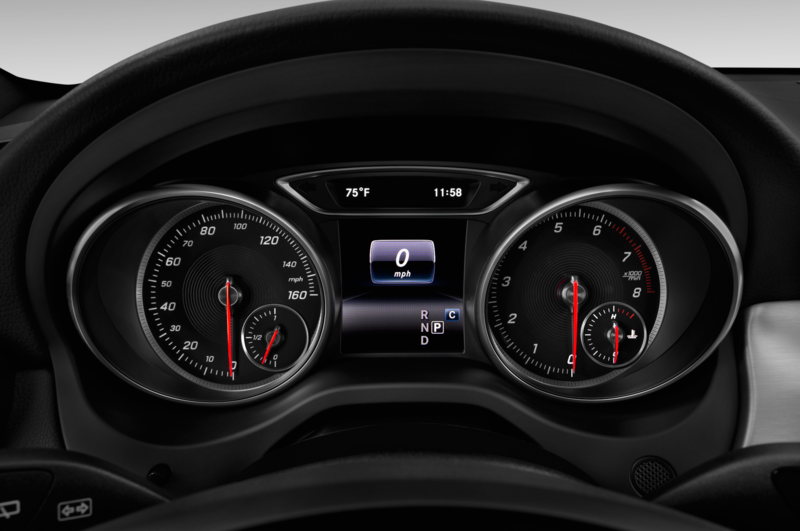 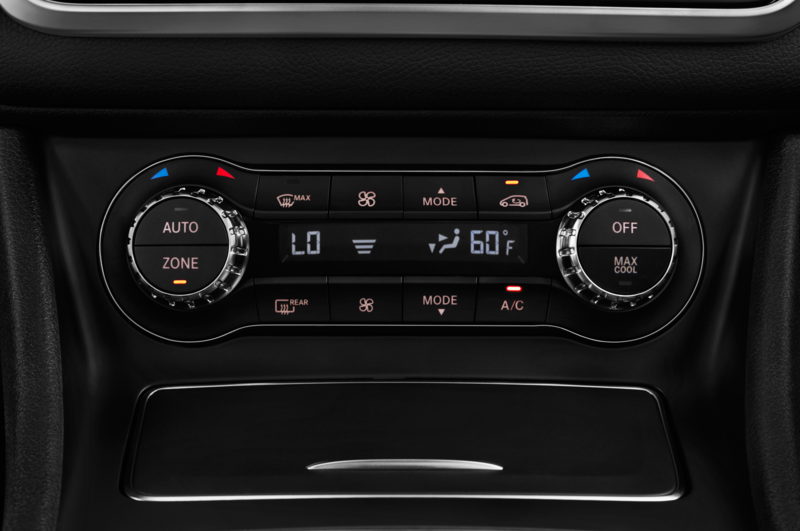 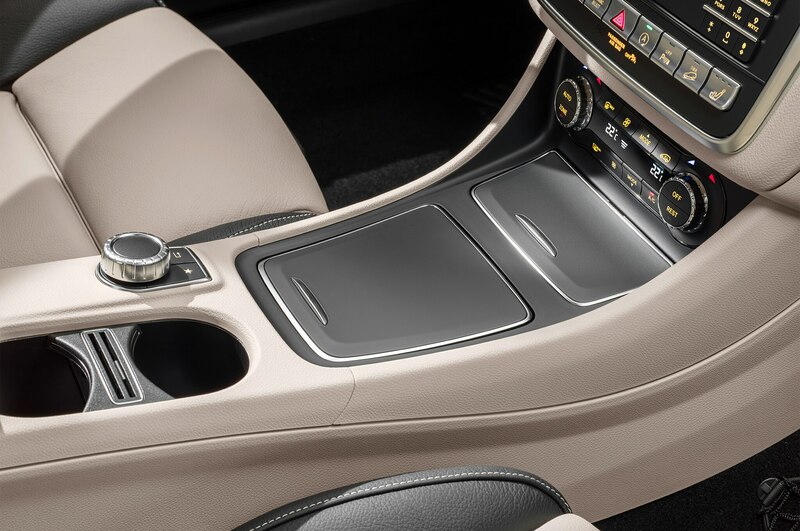 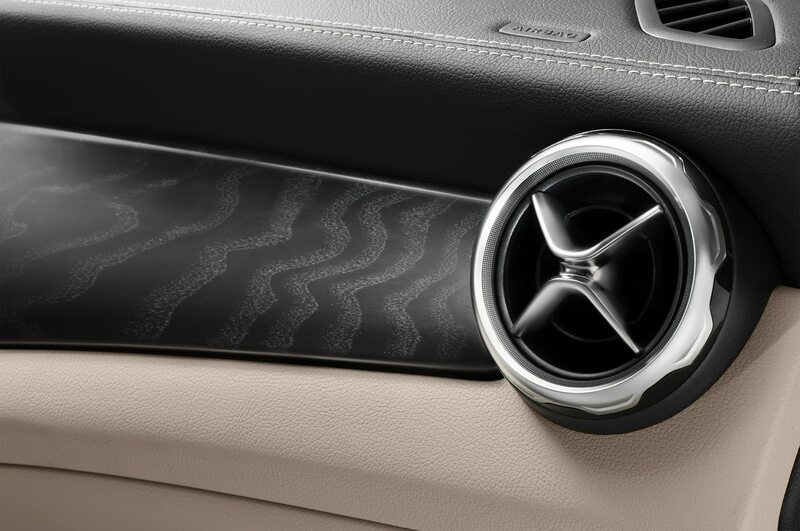 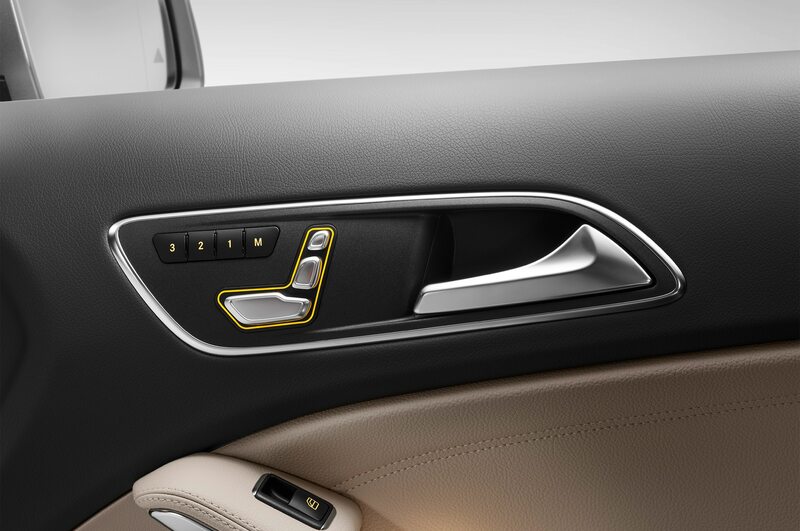 The facelifted interior includes a new instrument cluster, “Sail Pattern” replacing Anthracite as the standard interior trim, Android Auto added to the smartphone Integration Package, Black Ash Matte wood trim replacing Burl Walnut, and a new Parking Assist Package with a surround-view camera. 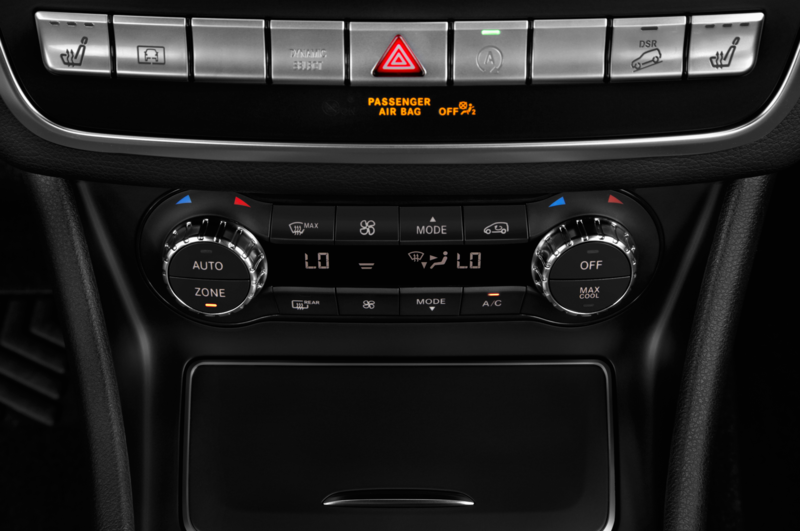 An eight-inch high-resolution center-dash display and a rearview camera now are standard, and handsfree access is added to the Premium Package. The leather bits are decent, and the plastic parts, including some garish color detail options in the AMG model are still not up to a Mercedes standard. 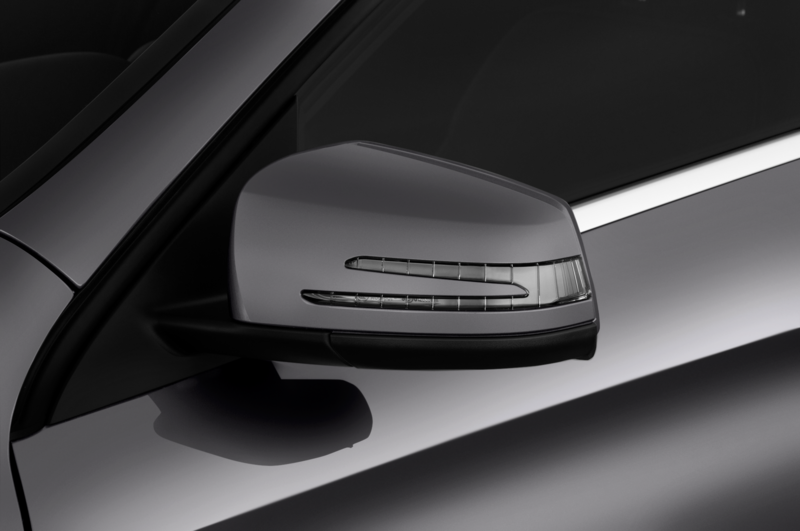 In this size category, the new, highly refined Honda Civic looms large in the CLA/GLA-Classes’ rearview mirrors. 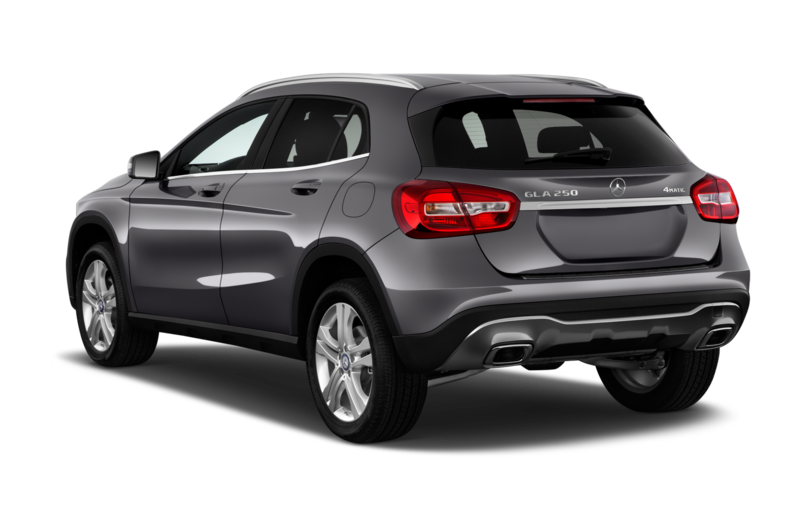 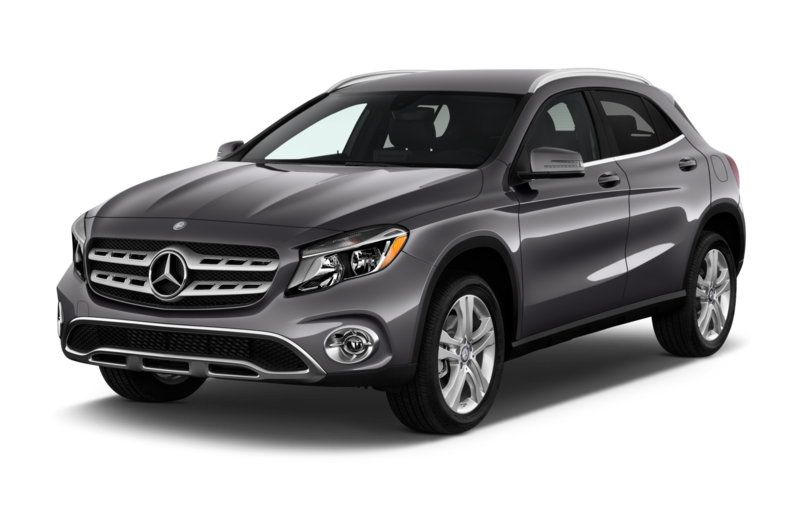 The $36,325 GLA250 4MATIC becomes more of a bargain if you need the crossover for some light to moderate offroading, or you face harsh winters. 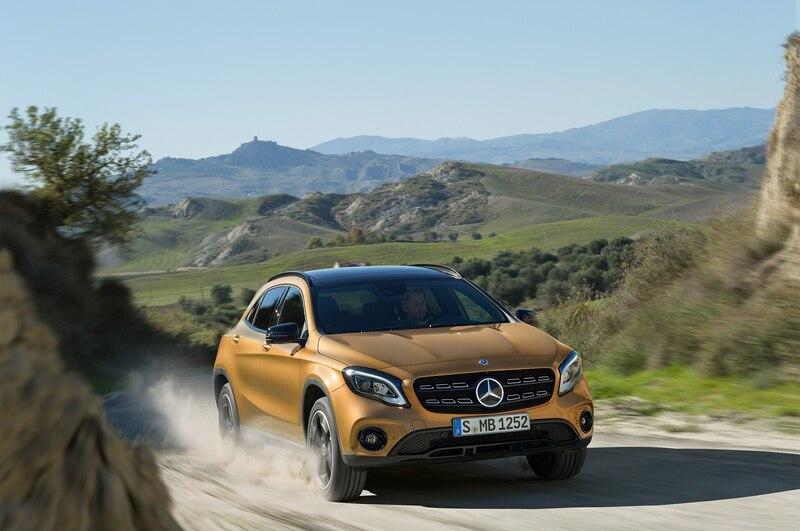 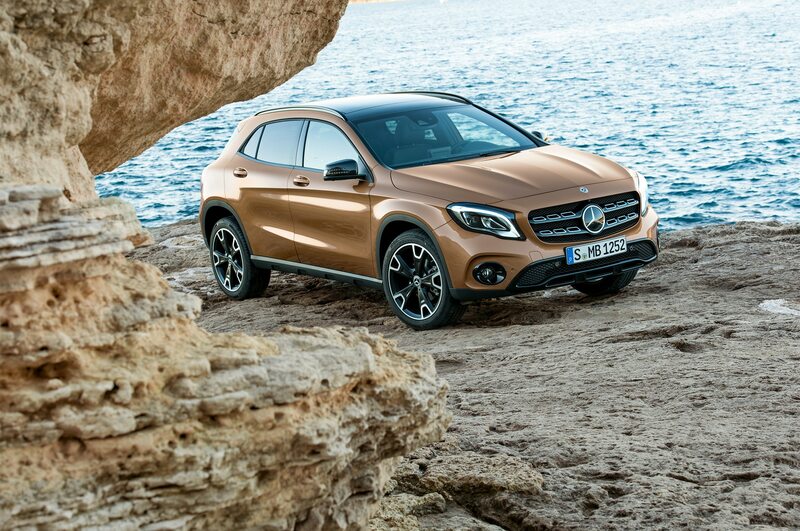 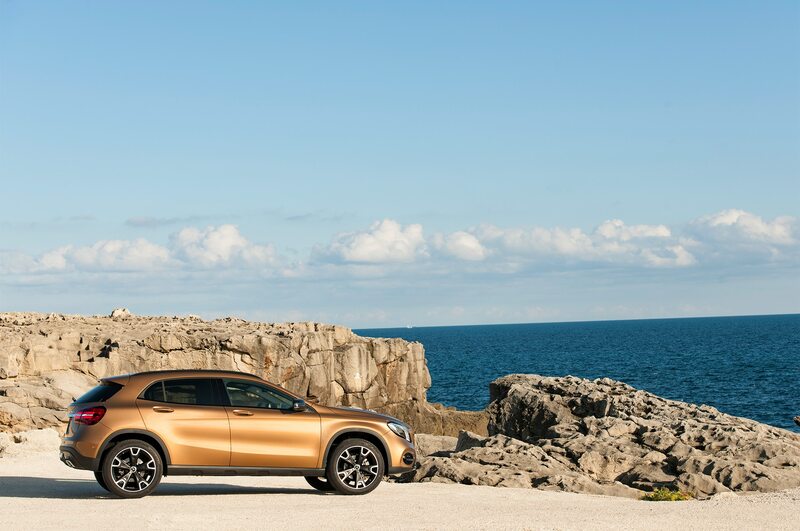 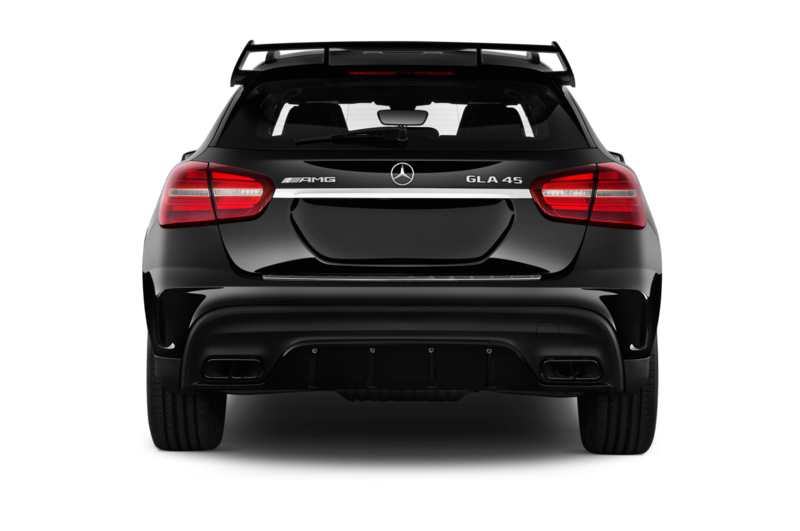 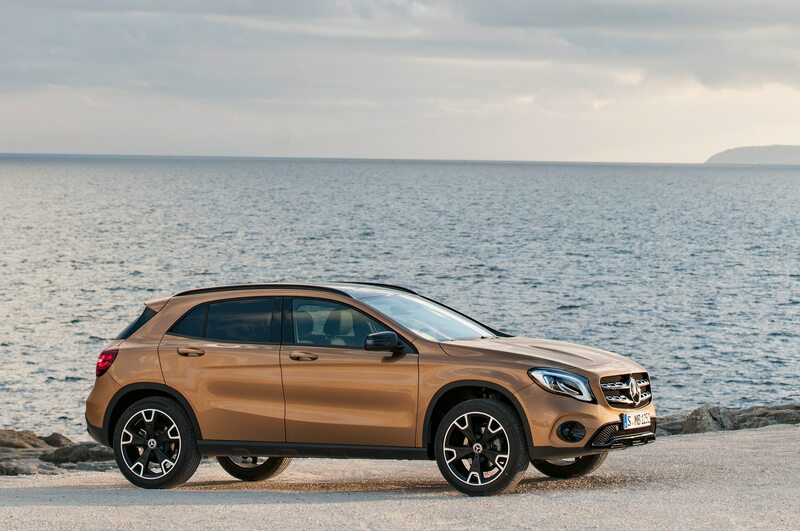 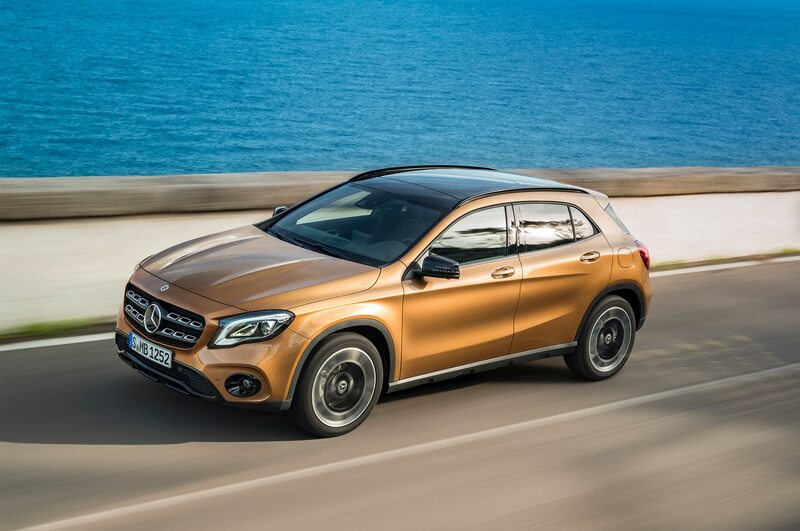 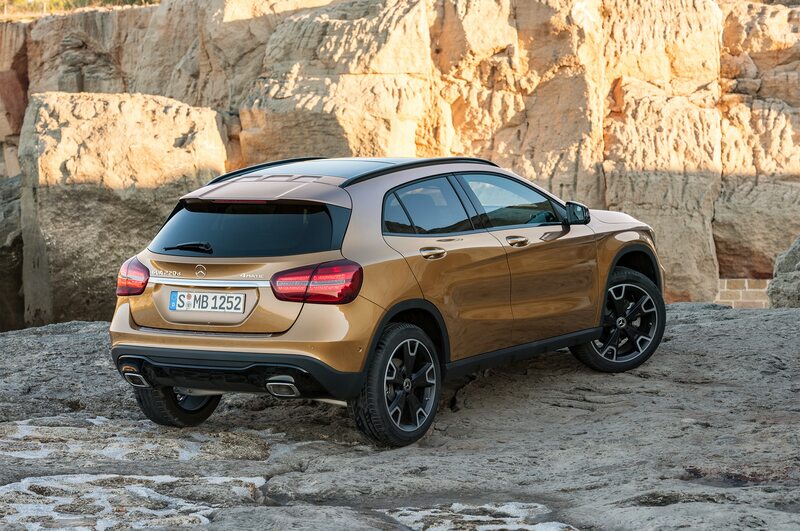 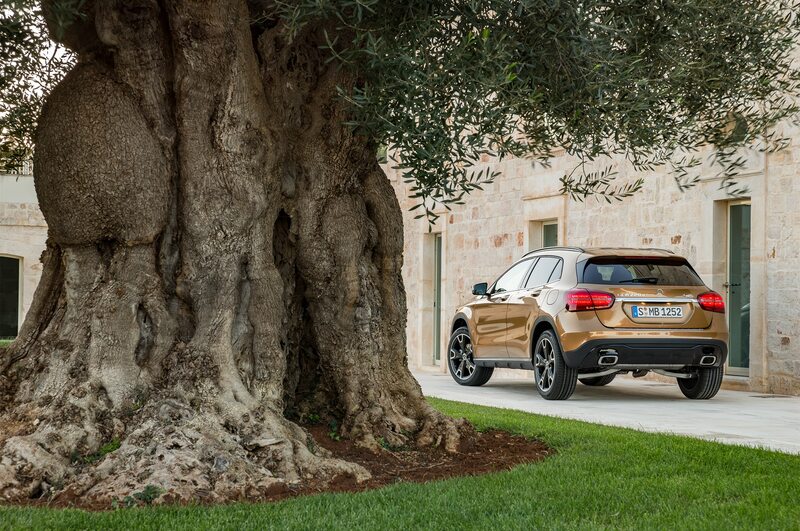 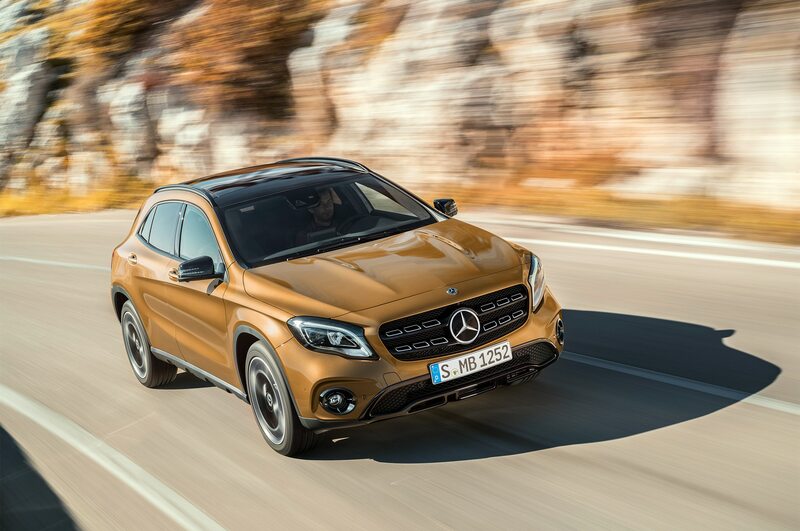 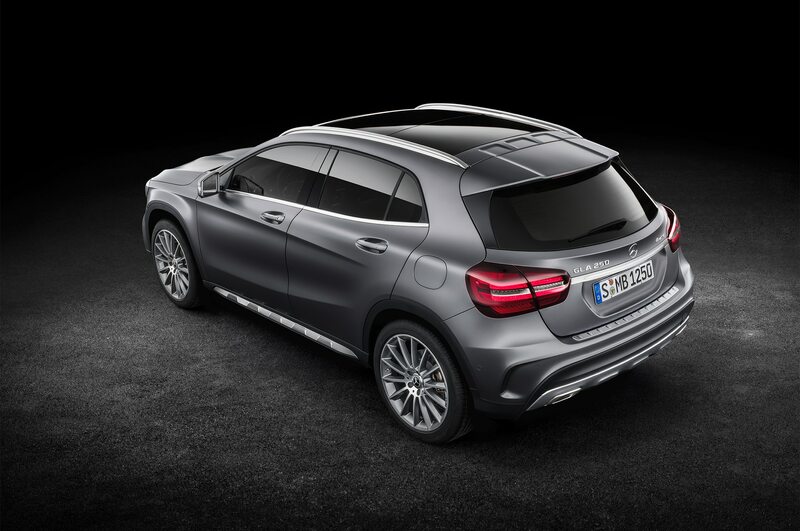 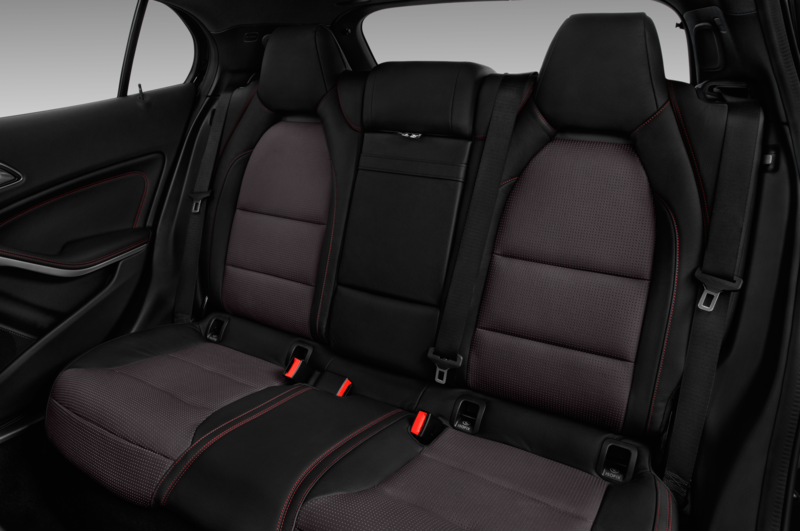 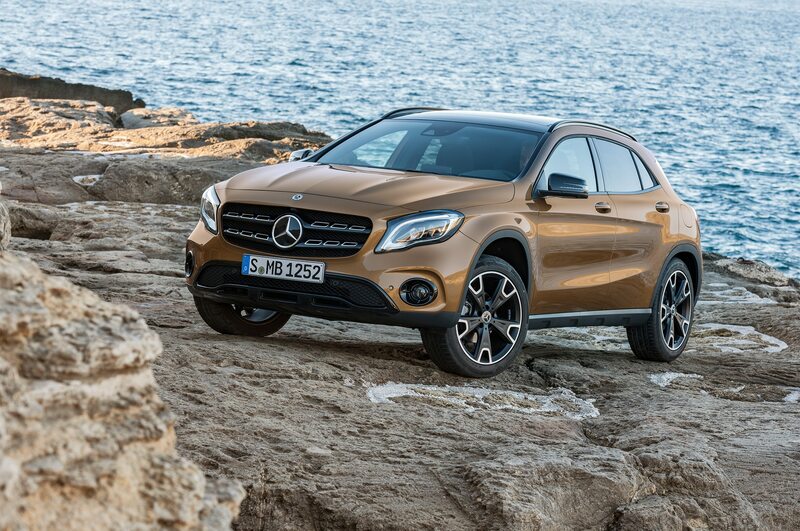 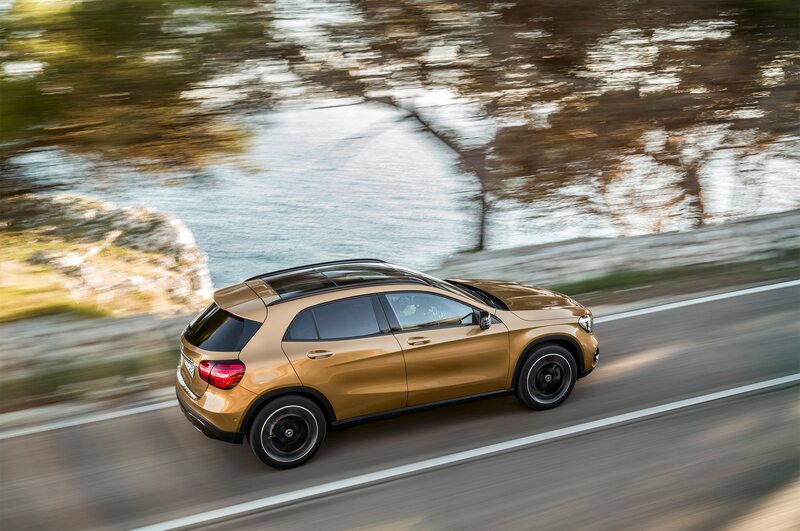 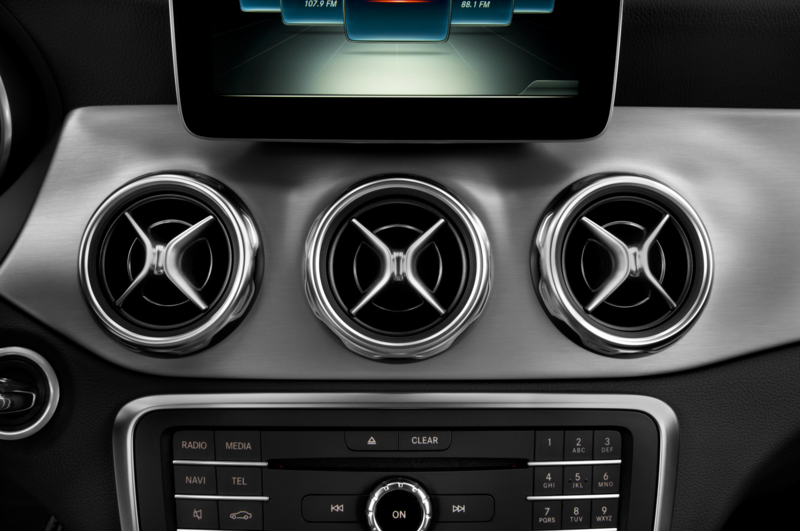 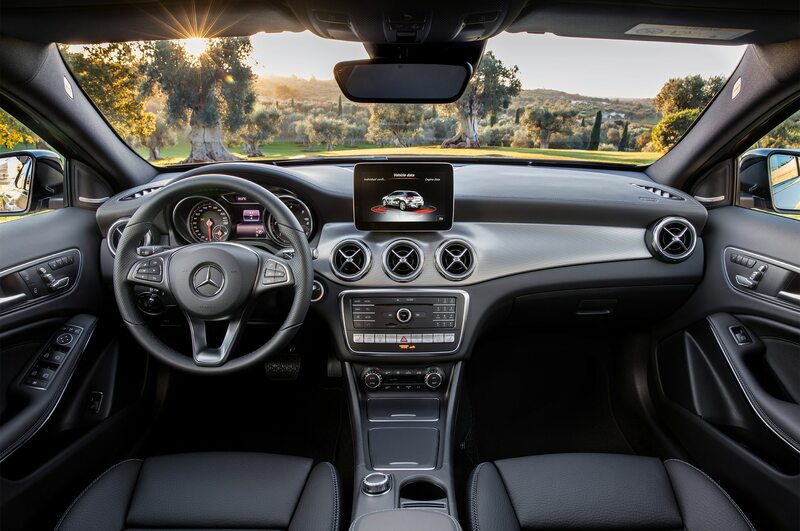 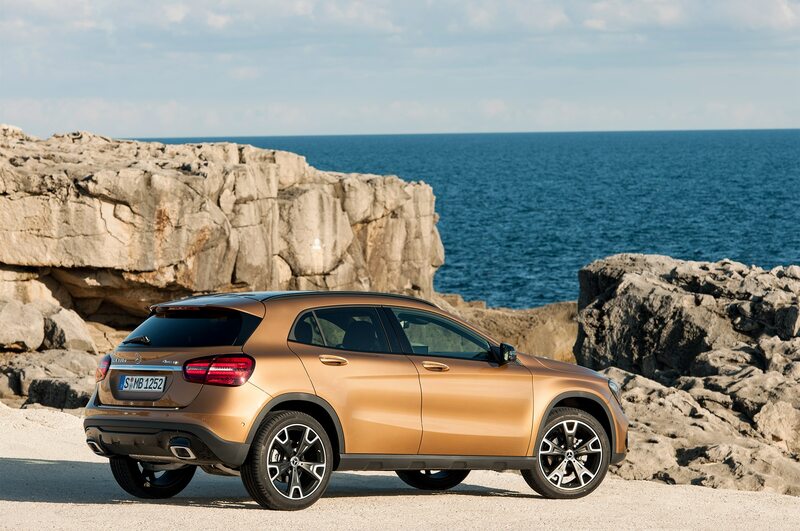 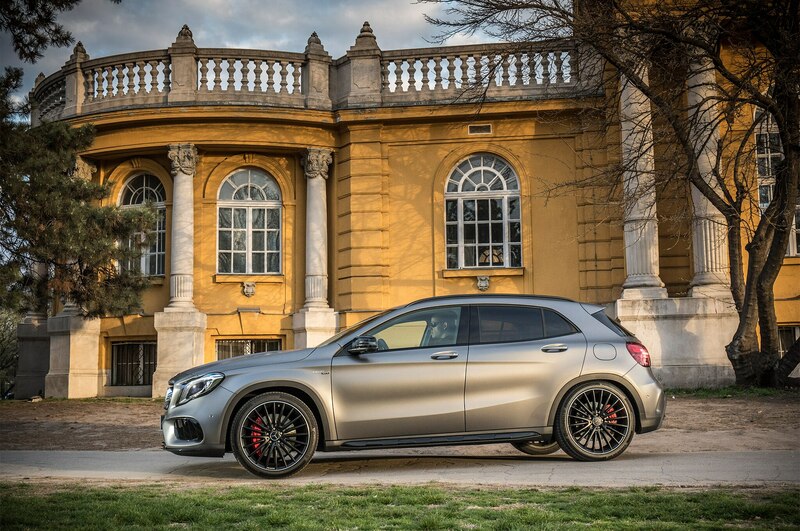 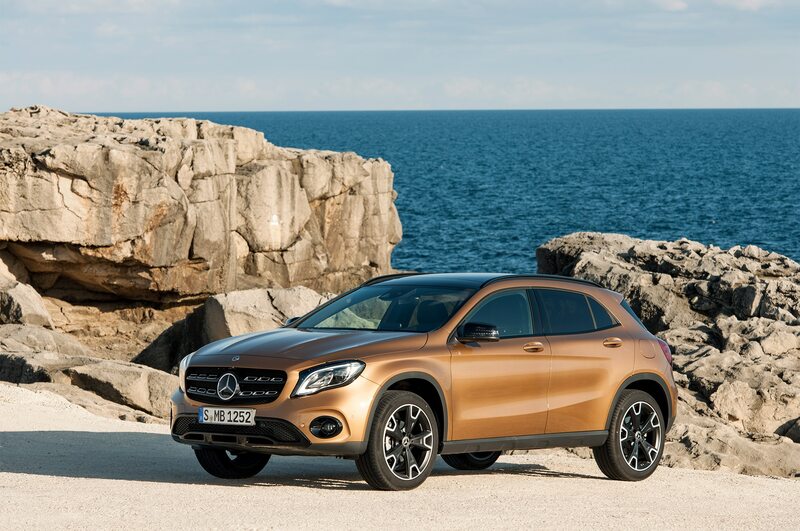 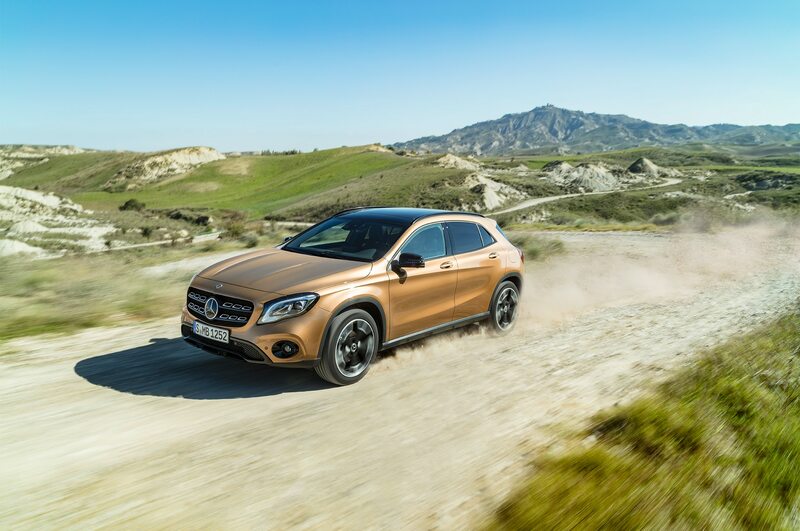 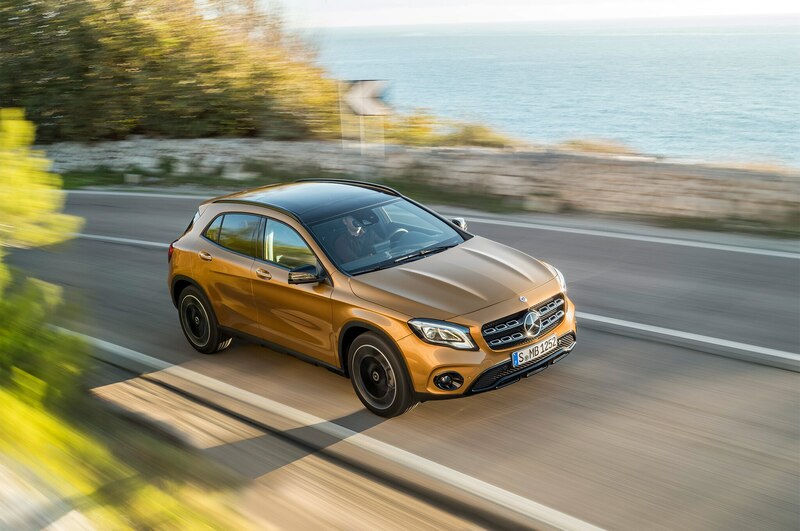 Along with the 4MATIC-only Mercedes-AMG GLA45, the GLA250 4MATIC now comes with an offroad drive program (called Offroad Drive Program), Offroad Display with a 360-degree and birdseye-view cameras, and a nifty Downhill Speed Regulation that lets you set the single-digit speed in 1 mph increments via the cruise control. 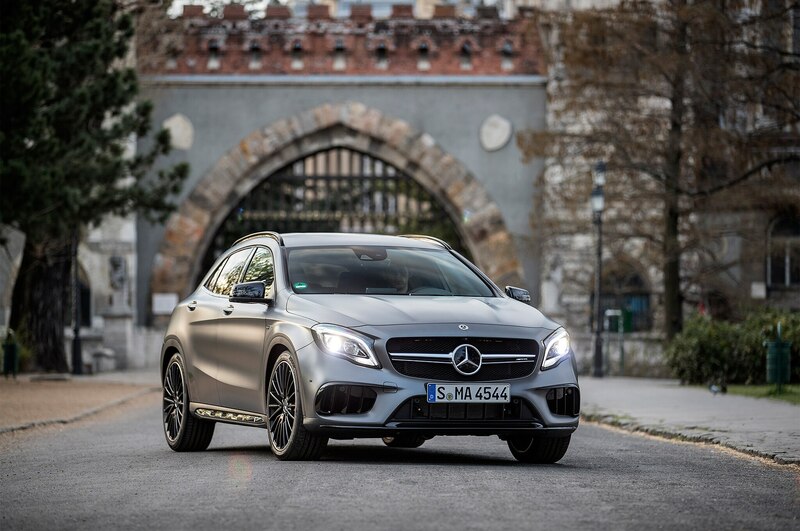 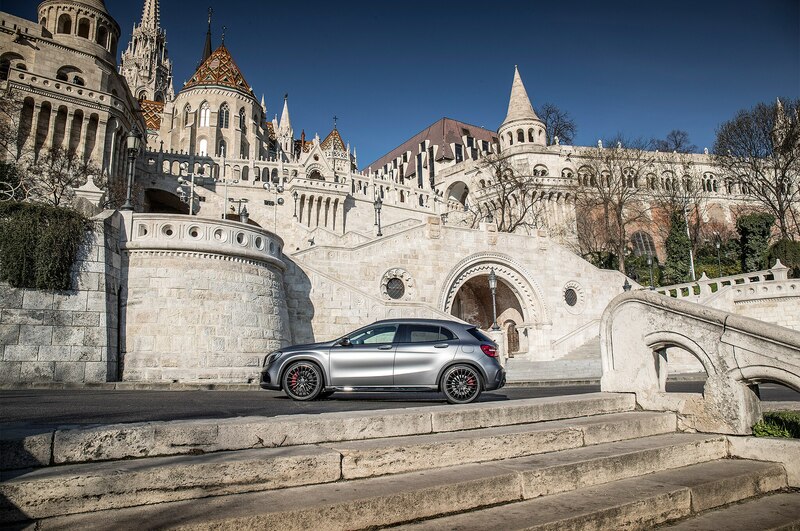 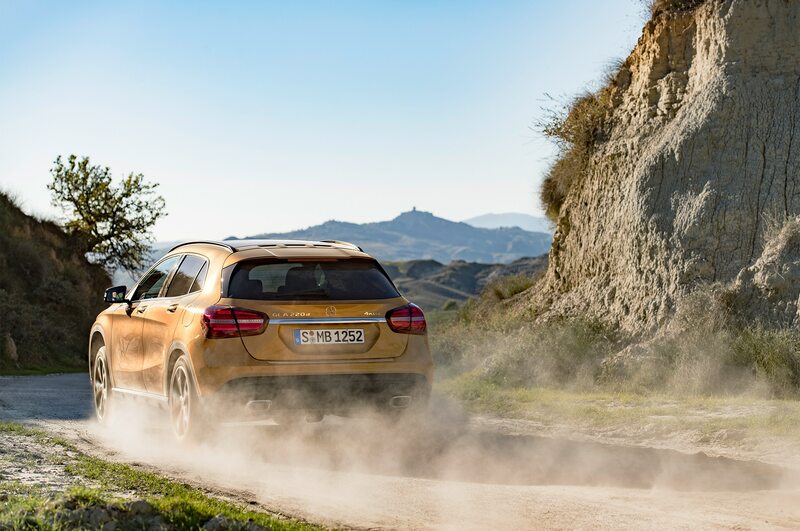 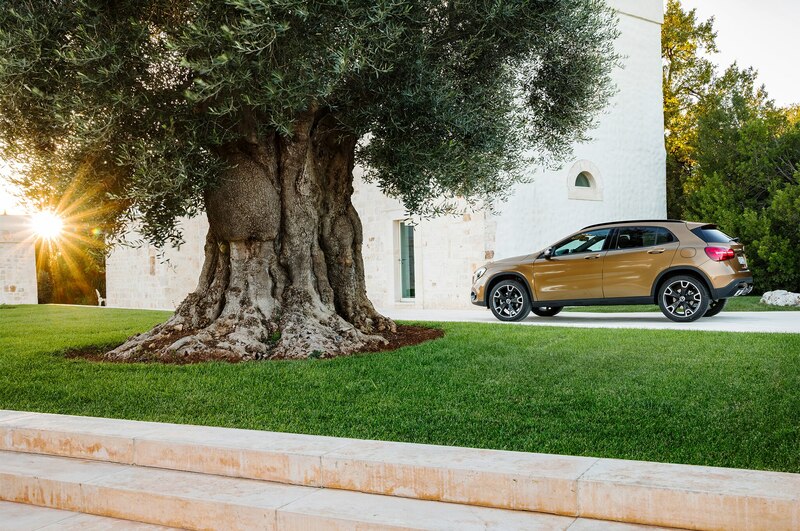 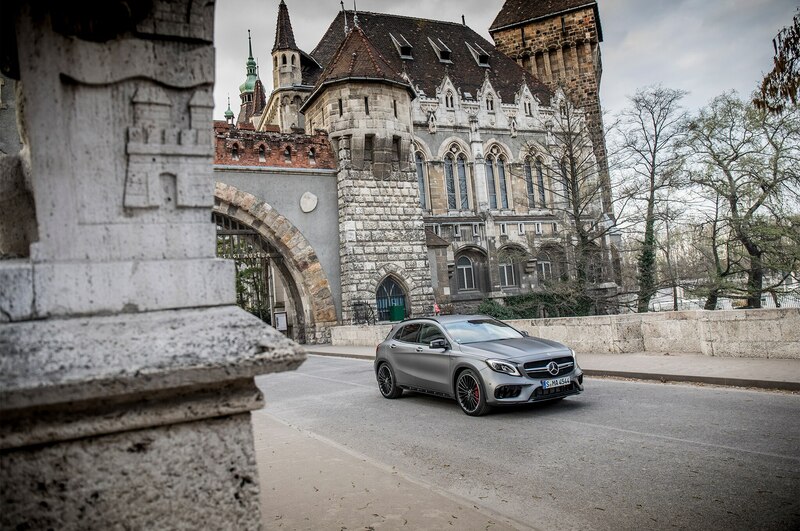 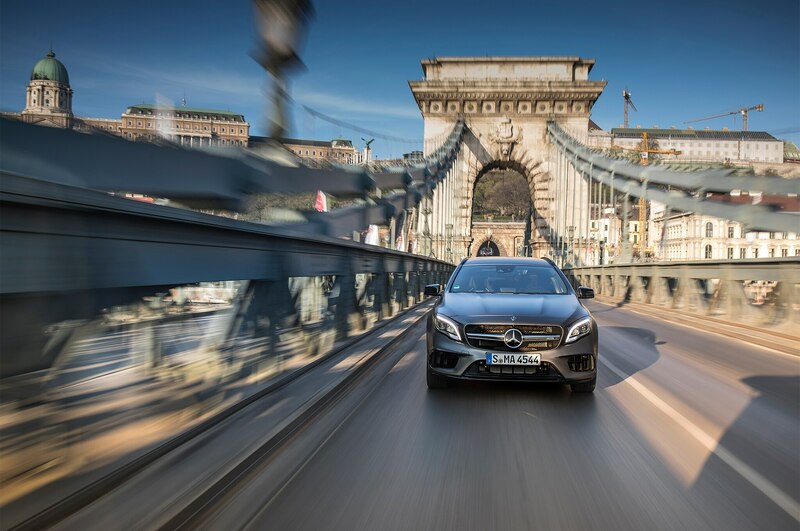 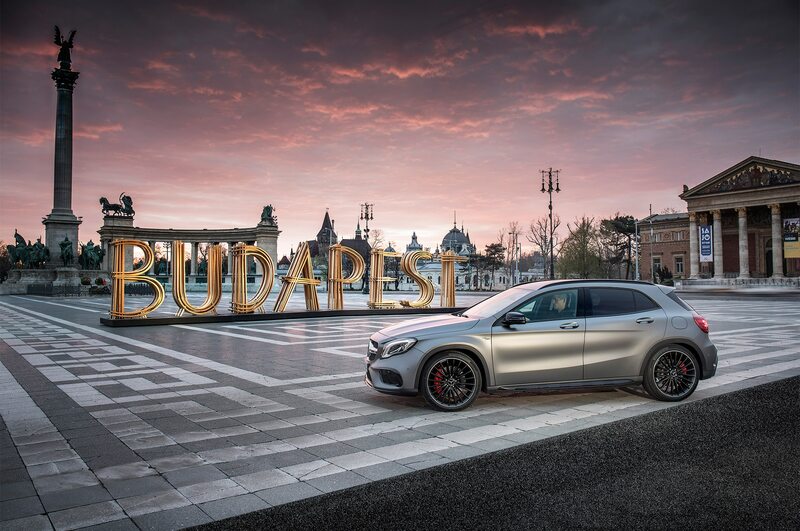 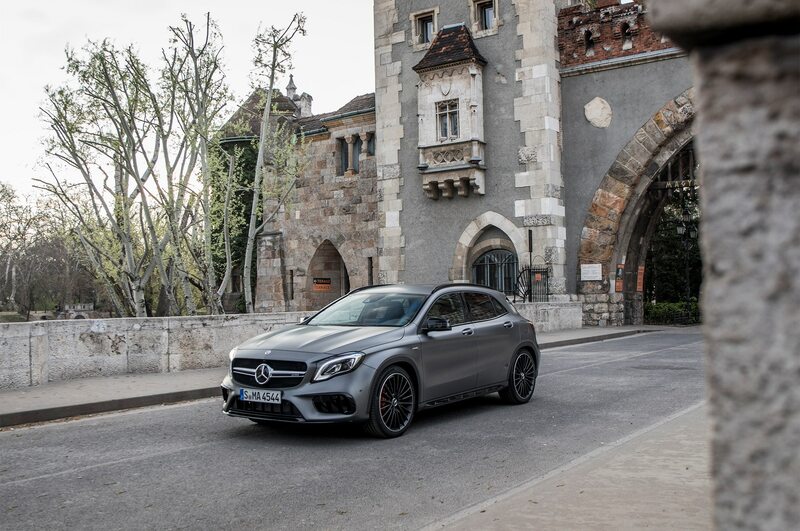 The only tester offered in U.S.-Spec GLA250 4MATIC trim was available for an offroad drive on a short course within the confines of the spectacular Hungaroring Formula 1 circuit. 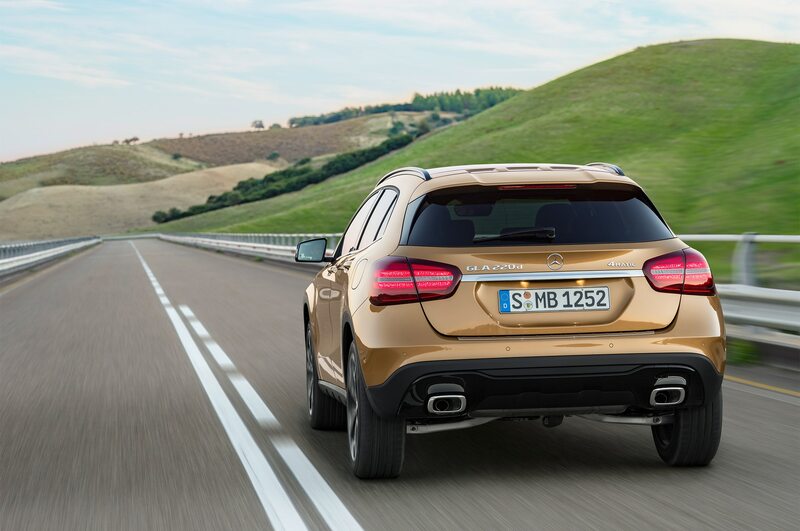 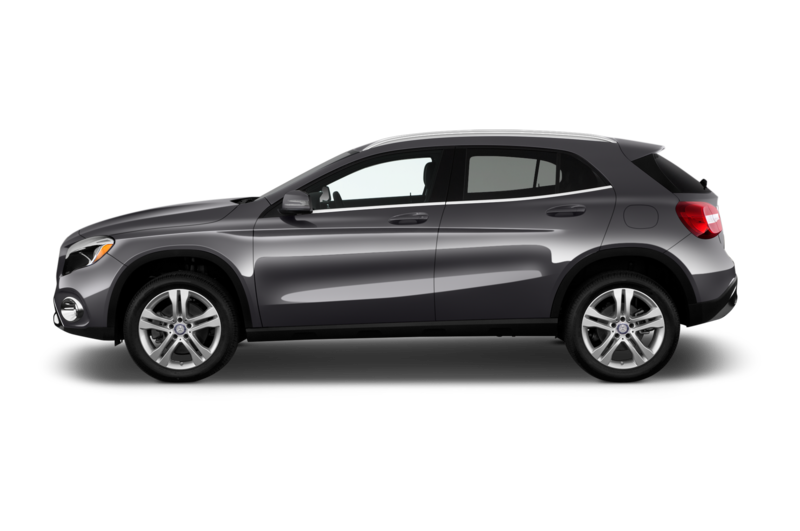 It acquitted itself nicely as an occasional off-roader, its 173.9-inch overall length navigating the tight treelined course where a GLC-Class would simply have to plow its way over some timber. 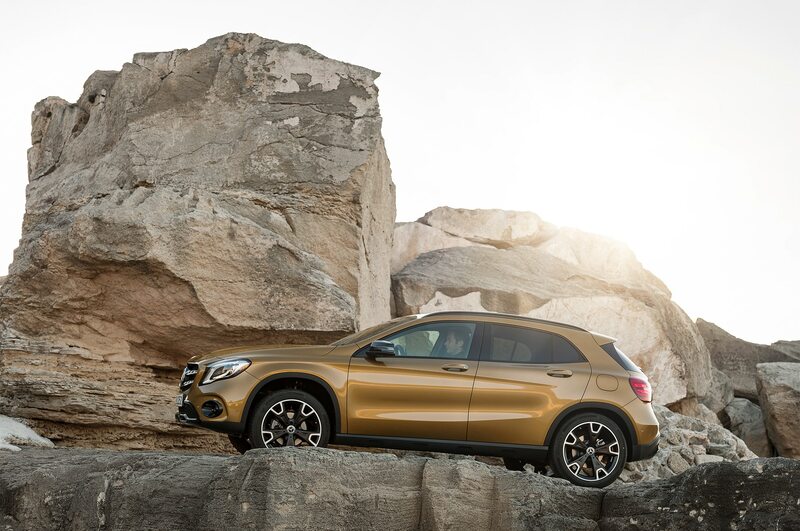 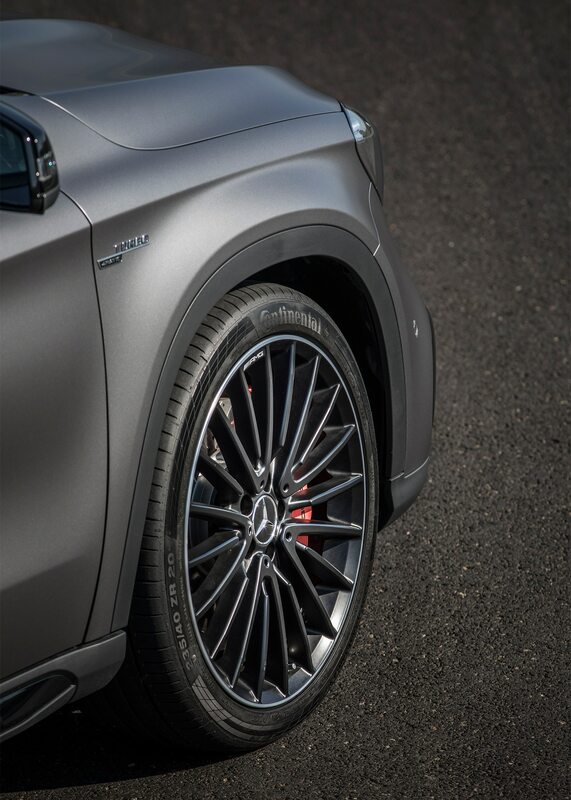 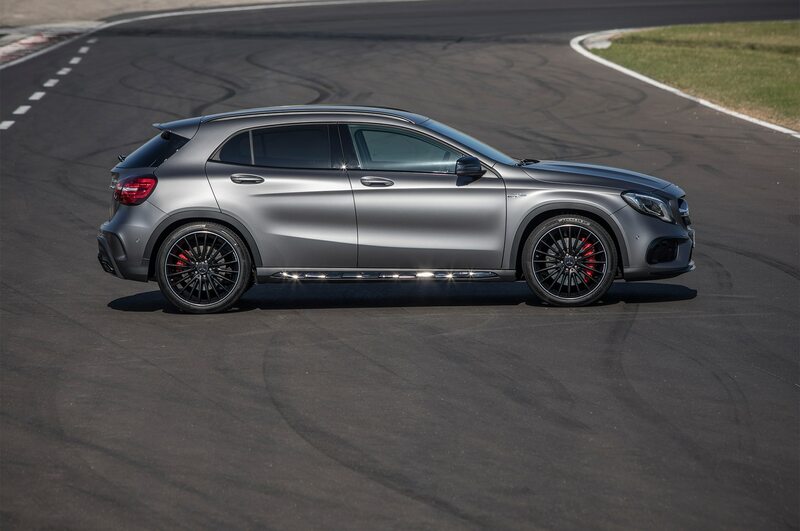 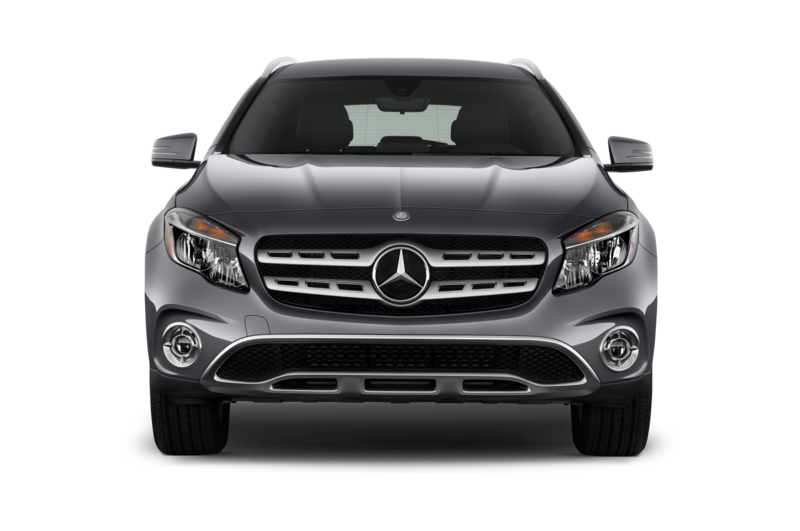 With a 100-percent front-wheel bias on dry pavement, the 4MATIC system lets the GLA slip oh-so-briefly in sand or on other slippery surfaces for a few nanoseconds until the system finds the wheel or wheels with grip. 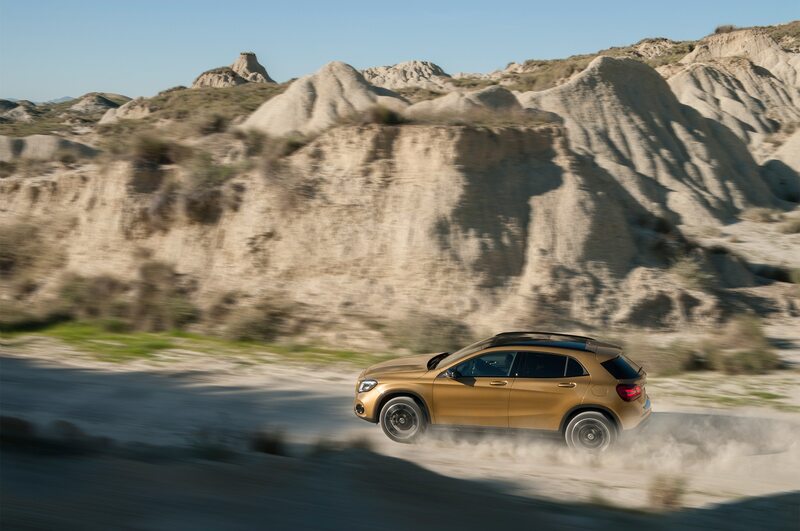 Long suspension travel allows for descent articulation. 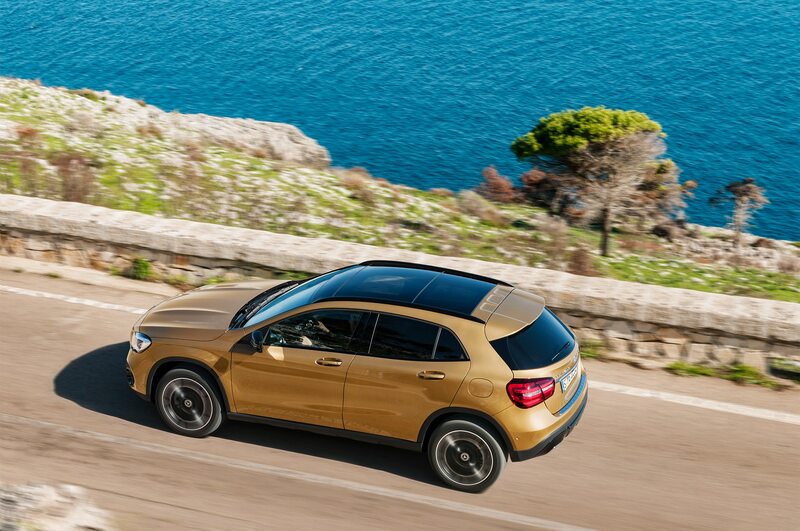 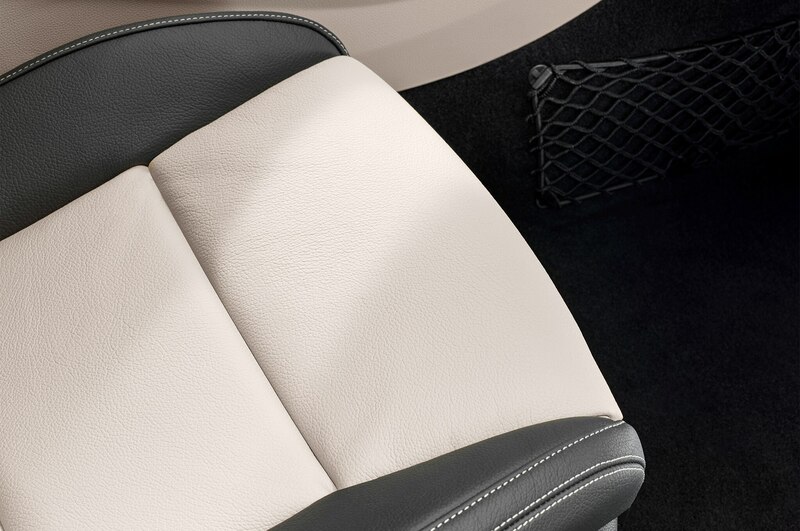 The cruise control-controlled Downhill Speed Regulation lets you descend foot-free without slowing down or picking up too much speed, and the surround-camera lets you take a blind corner without risking paint on those newly redesigned bumpers. 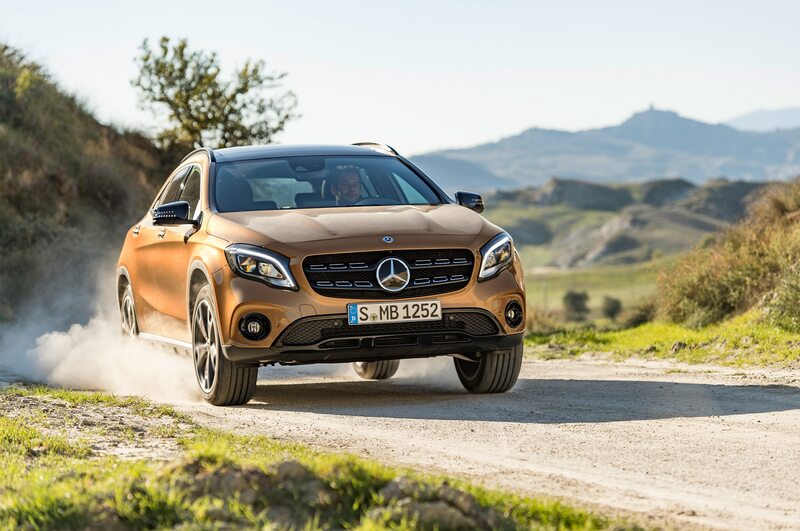 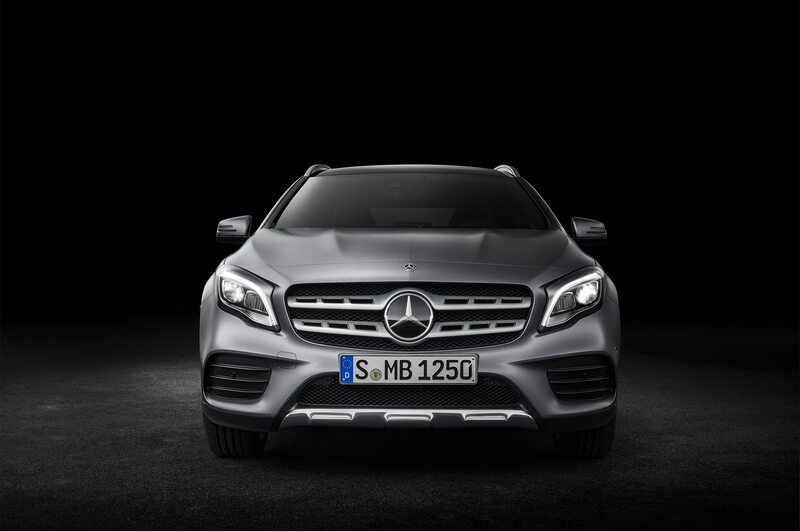 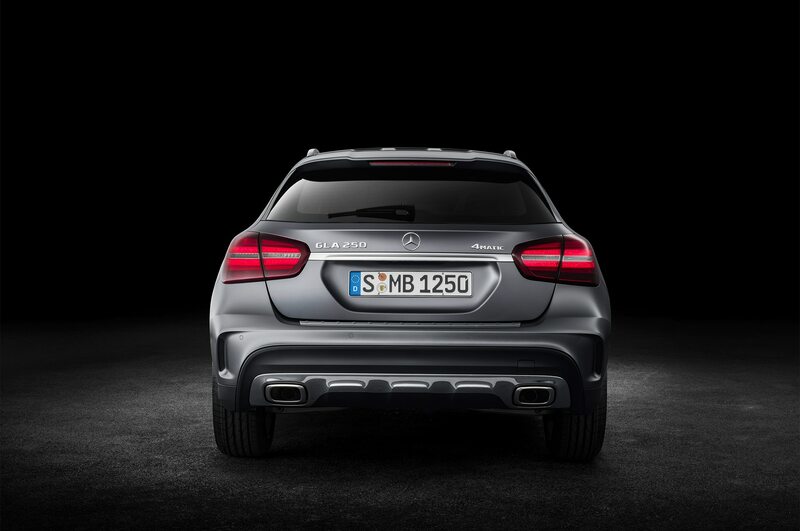 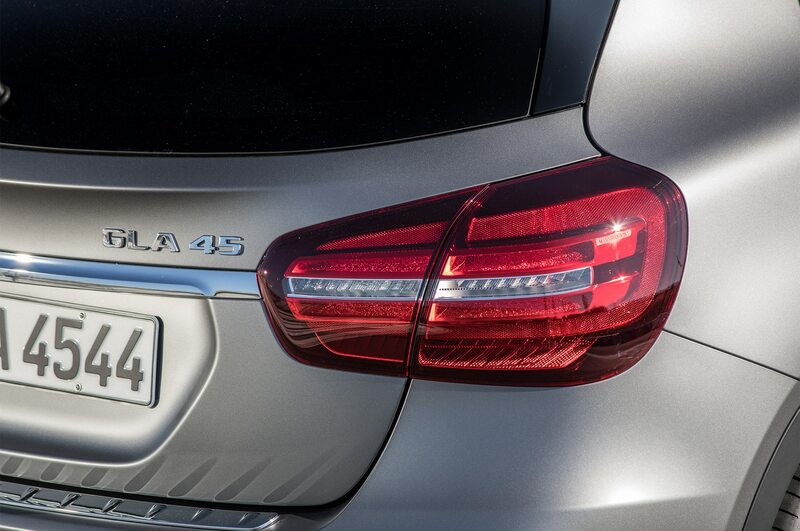 In this highly controlled milieu, at least, the GLA250 4MATIC appears to have an edge over its soft-road competitors. 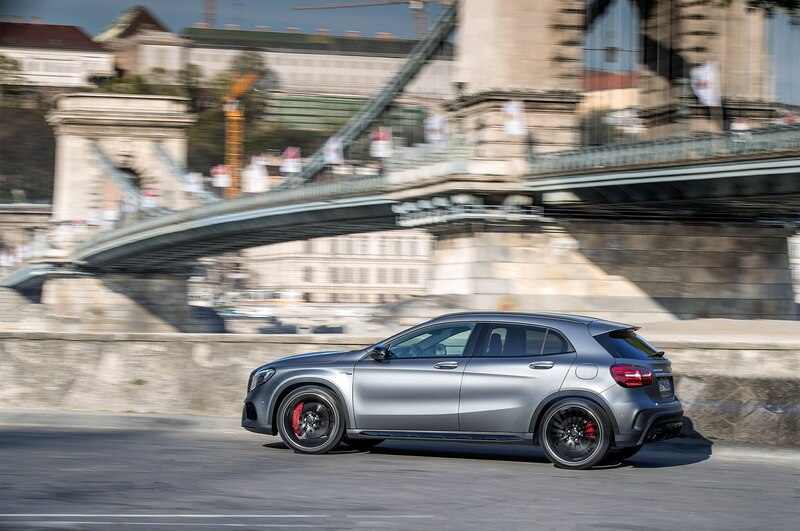 On the Budapest daily commute circuit, the deep-red GLA45 was an entertaining tall-ish hot hatch, with a firm, yet not crashy ride over crusty two-lanes, and the ability to get around tight corners with minimal understeer and just a tad bit of yaw. 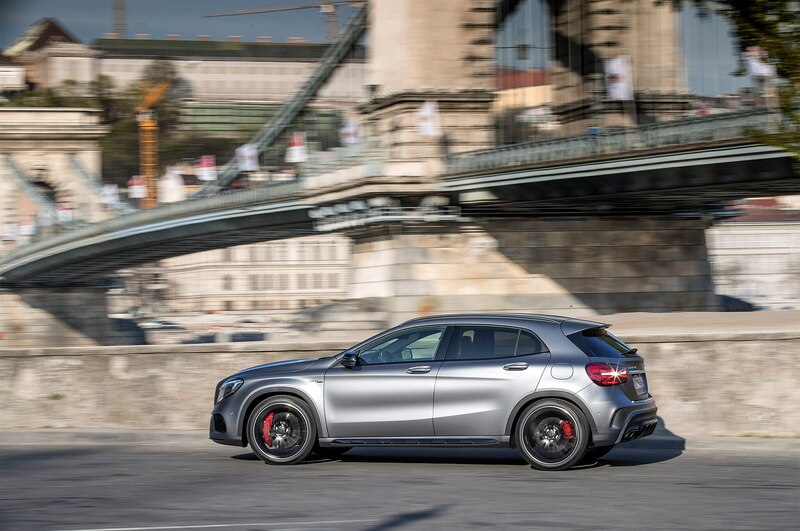 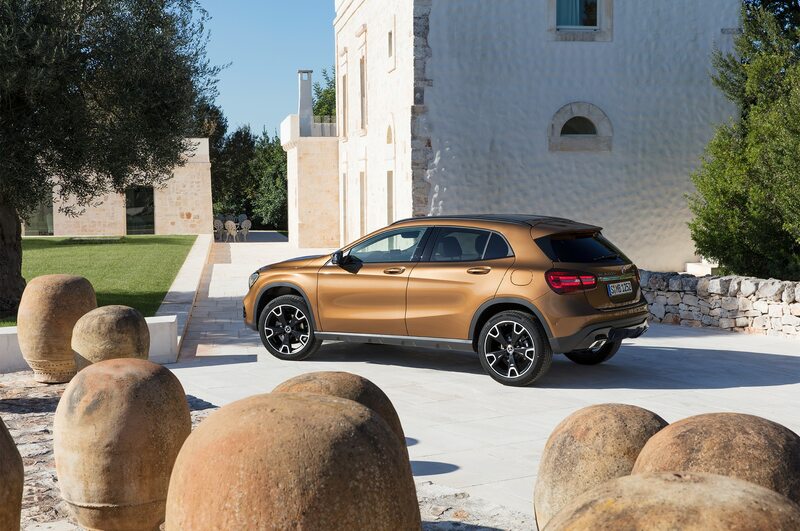 It’s important to note that the GLA is a true “crossover” because it’s not so very tall – just 58 inches high for the AMG version, which is 2.3-inches taller than the low-slung Mercedes-AMG CLA45 4MATIC. 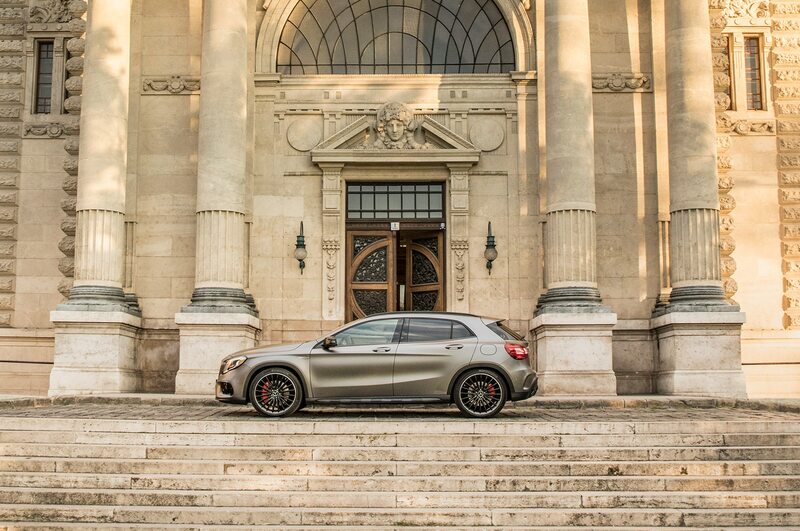 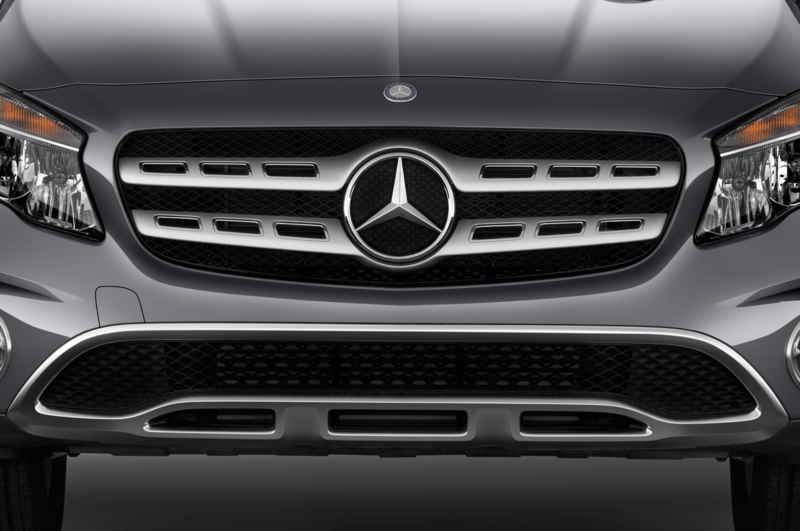 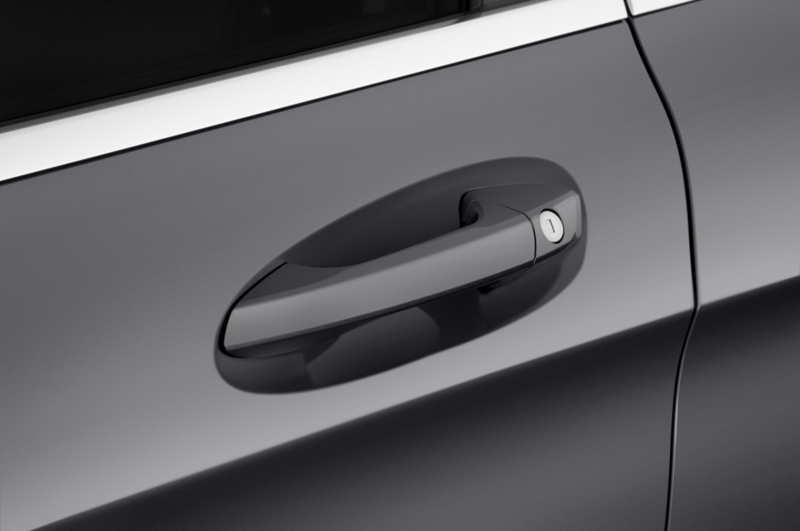 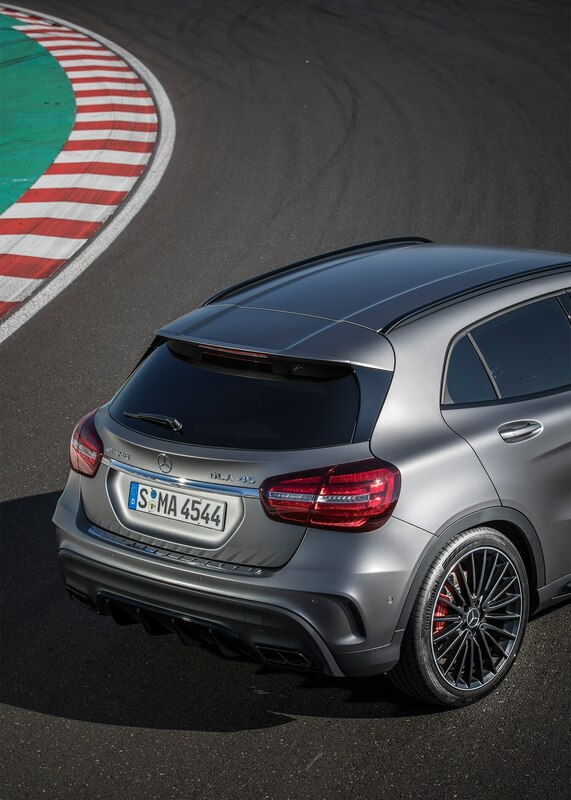 AMG doesn’t need to mitigate a high center of gravity with rock-hard dampers and springs. 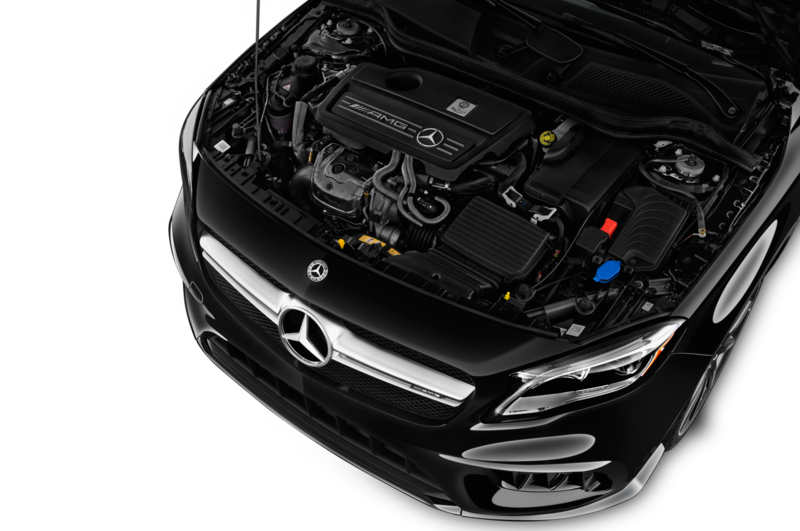 AMG proudly notes that its “handcrafted” 2.0-liter turbo engine is the highest-output production four-cylinder on the market. 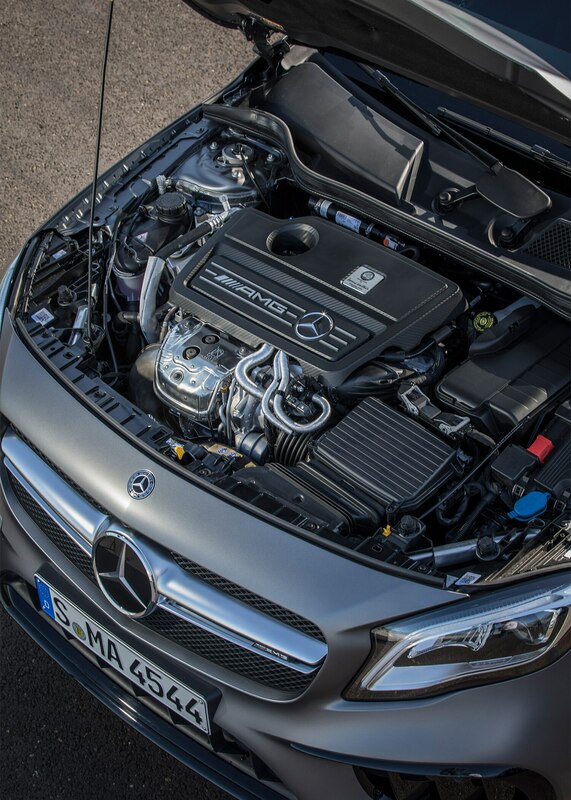 This perhaps makes up for the fact that it’s a bit peaky and feels unrefined for a Mercedes engine. 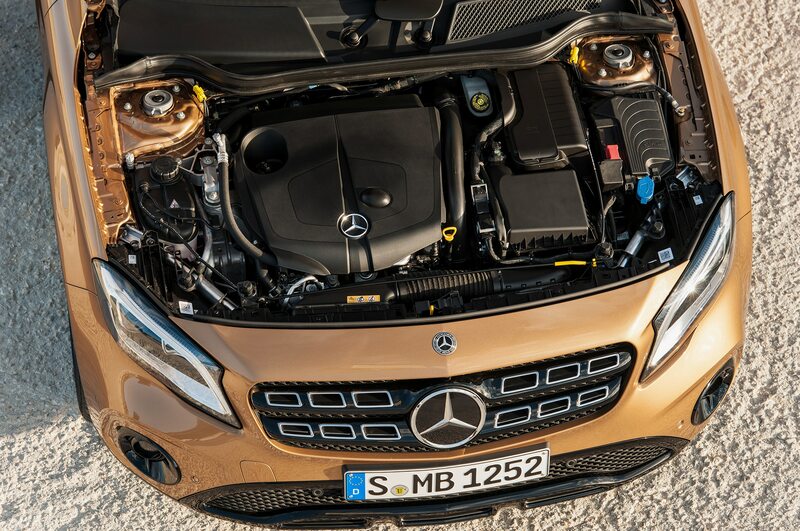 This is not uncommon in the modern market, where both Mercedes-AMG and all its competitors are in the early stages of refining their new age, small-displacement, high specific-output turbo engines. 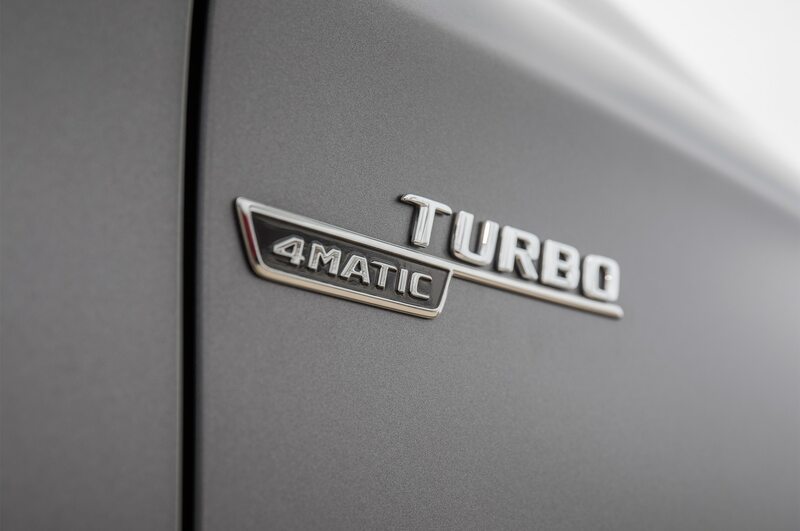 The 4MATIC system, while distributing 100-percent of torque to the front wheels under normal acceleration, quickly distributes twist to the rear wheels when you give it the boot, thus avoiding torque-steer. 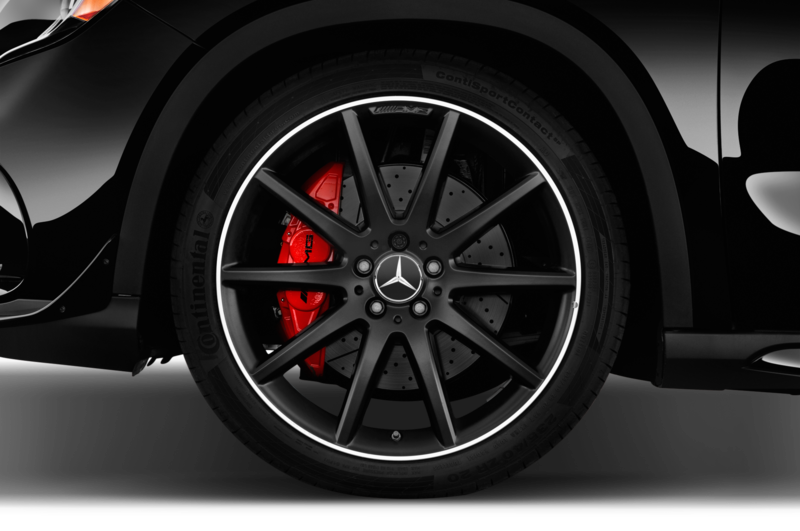 Steering feedback is pretty good, and the strong, positive brakes are perhaps the most Mercedes-like feature of this model. 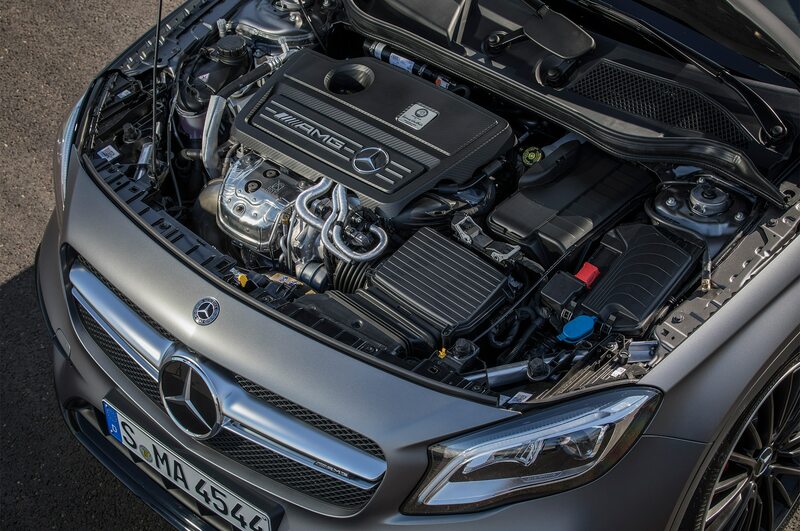 Controlling the AMG Speedshift seven-speed dual-clutch transmission is a disappointment. 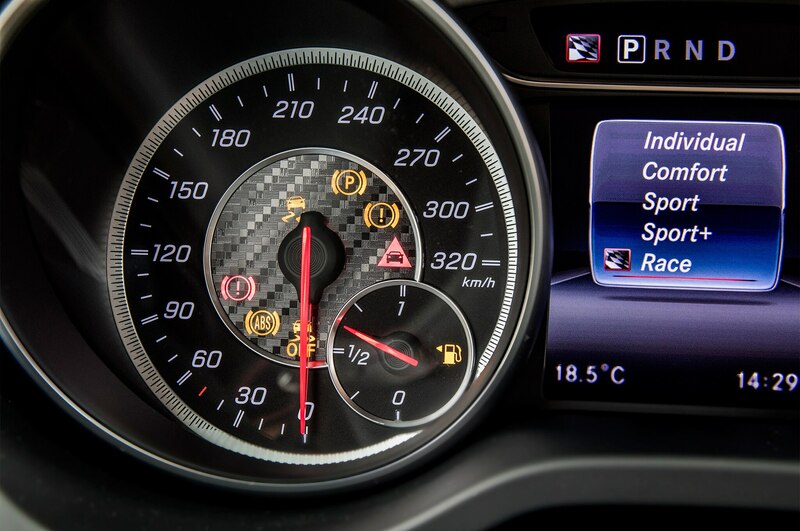 Well, perhaps not, considering the Mercedes-Benz CLA250 first-drive two years ago uncovered a transmission that won’t remain in manual mode if you keep it in the same gear for something like 30 seconds. 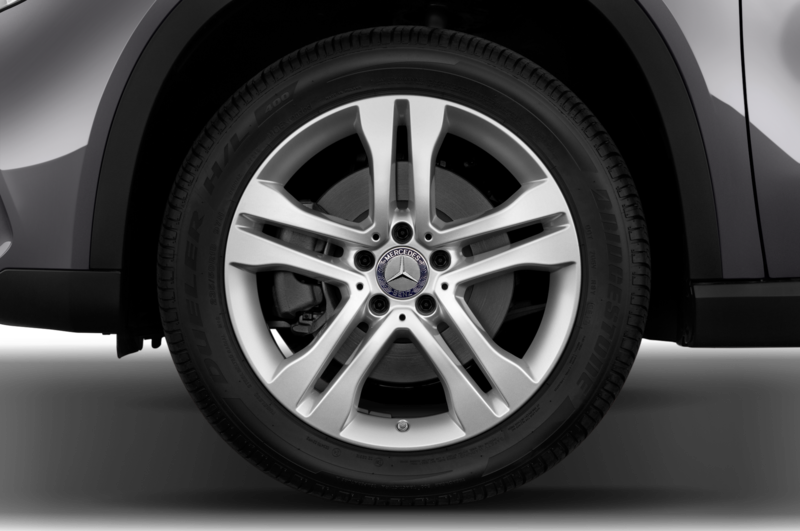 That was the standard Mercedes 7-speed DCT. 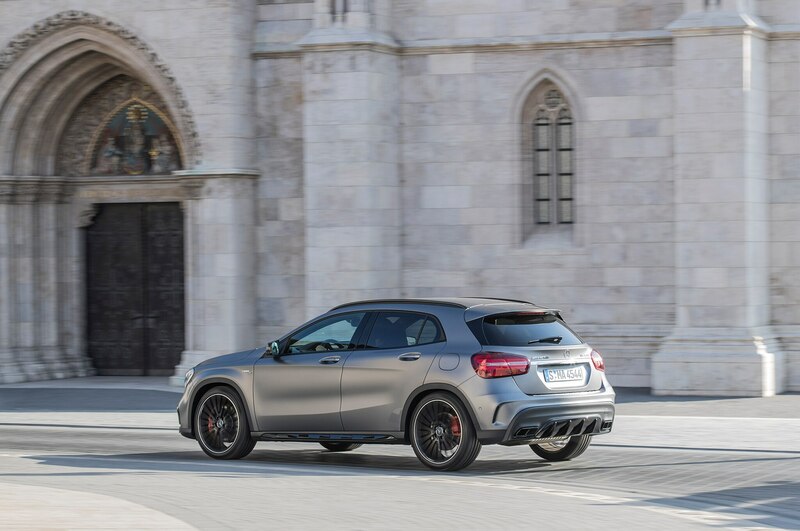 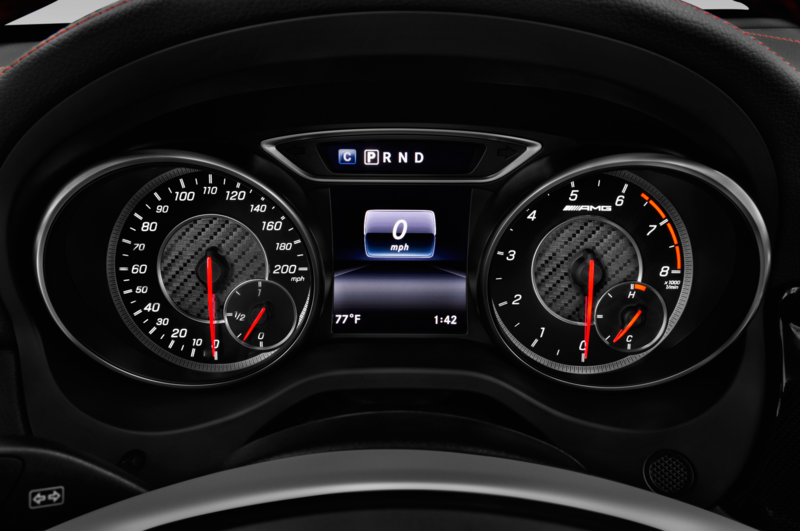 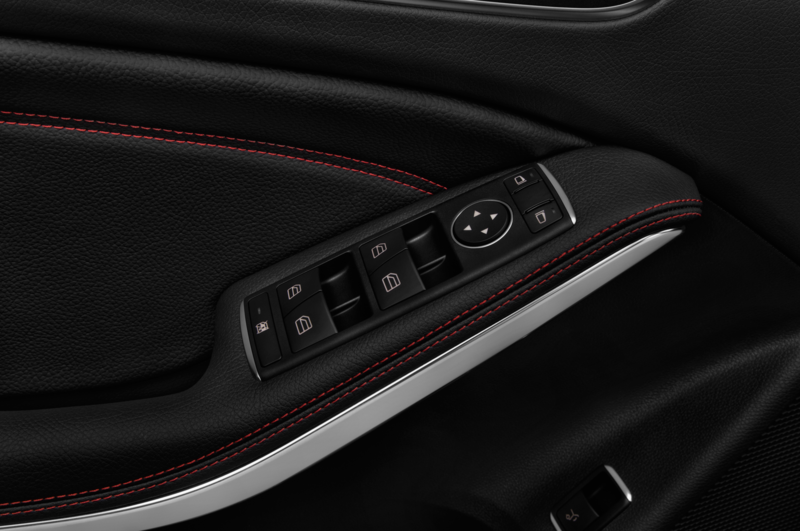 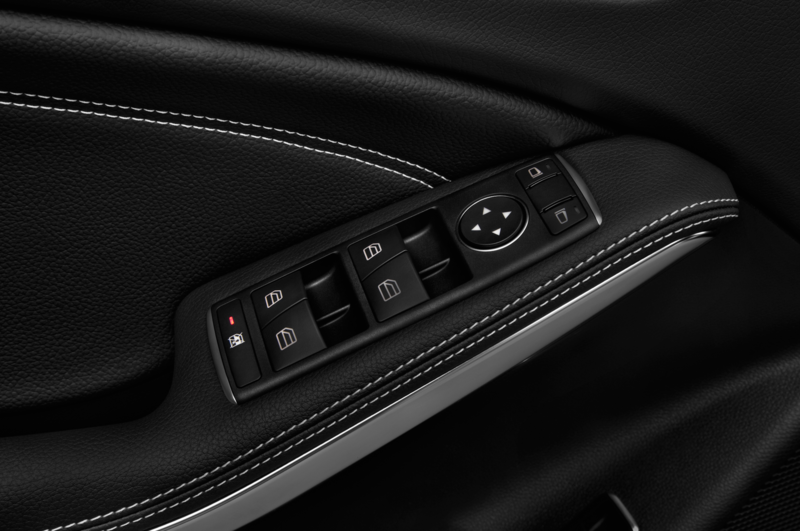 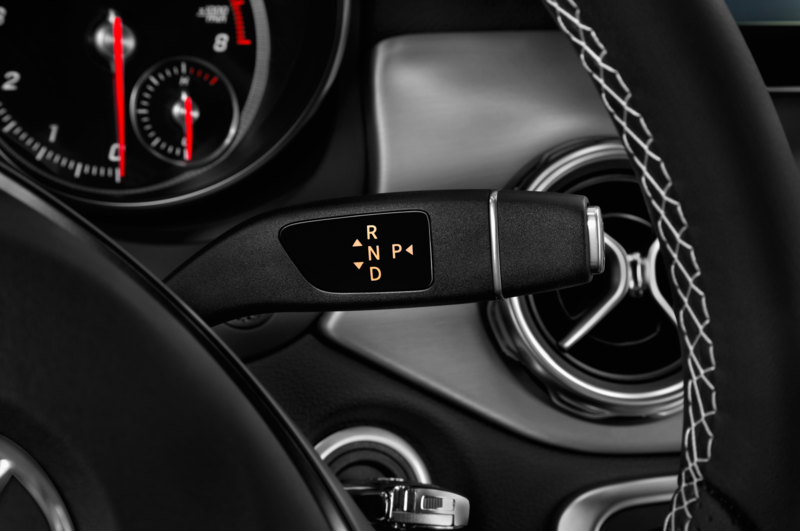 The Speedshift in the AMG GLA45 4MATIC did the same when the “sport” dynamic mode was selected. 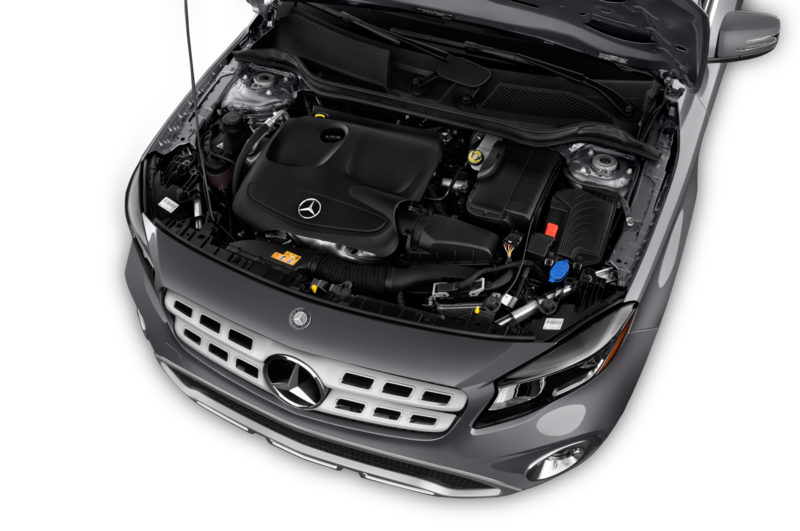 Your Humble Servant tried “sport+” on the road, and the transmission did, indeed hold a gear, up to a point. 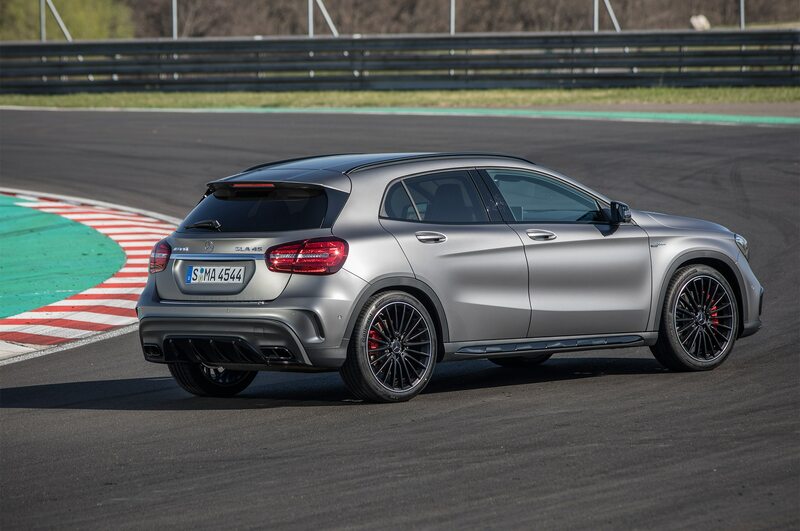 Strangely, it downshifted aggressively in some turns when I wasn’t slowing down much. 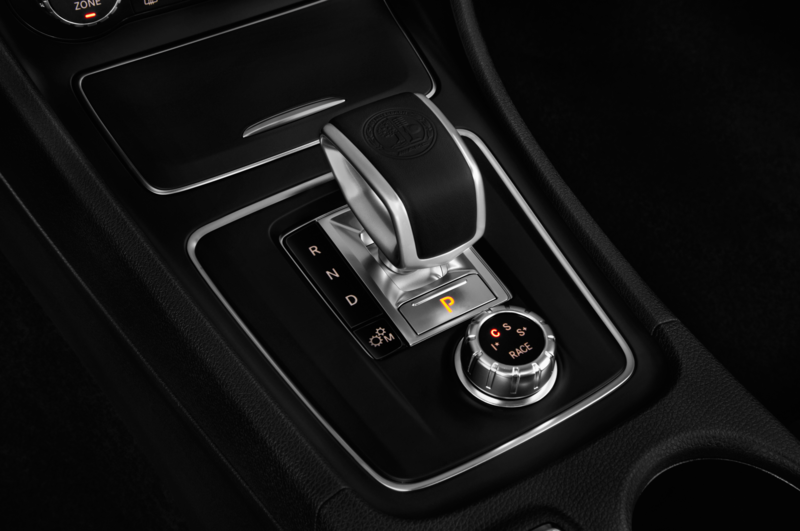 Meanwhile, I could detect no difference in handling between the two modes. 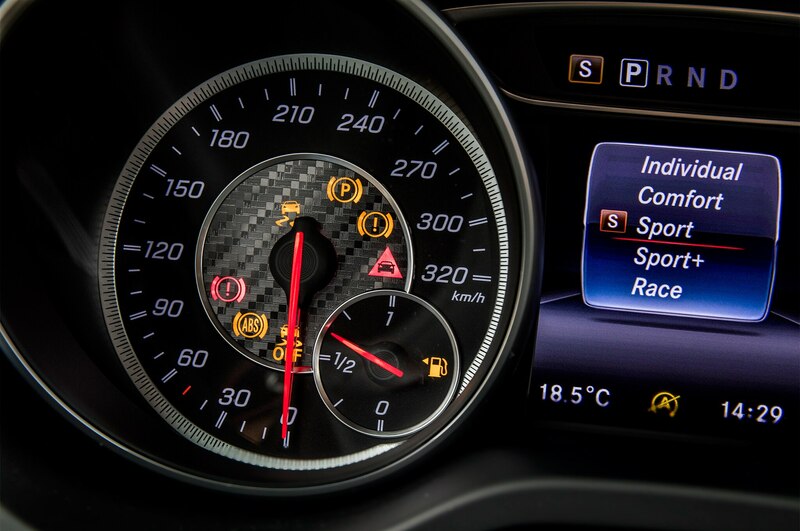 Heck, just leave it in sport+ and let the Speedshift shift itself. That’s what I did when Benz let us loose on the Hungaroring with a Mercedes-AMG A45 4MATIC. 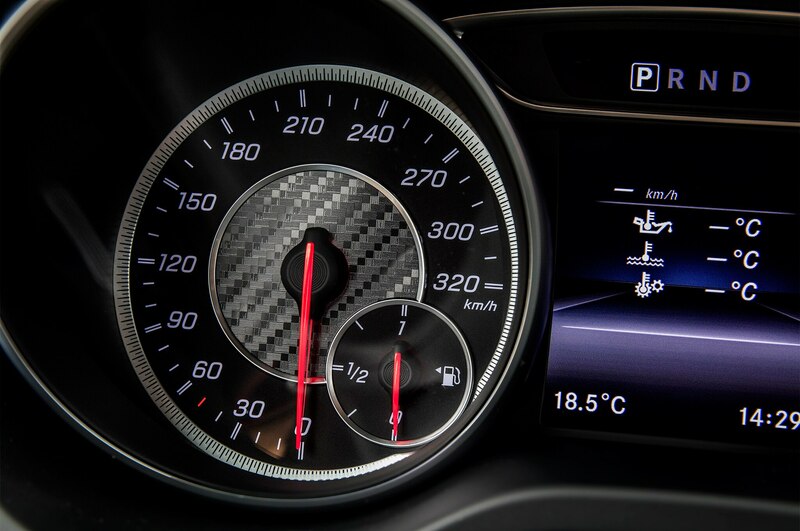 The Speedshift made all the right upshifts and downshifts around each of the Hungaroring’s 14 turns. 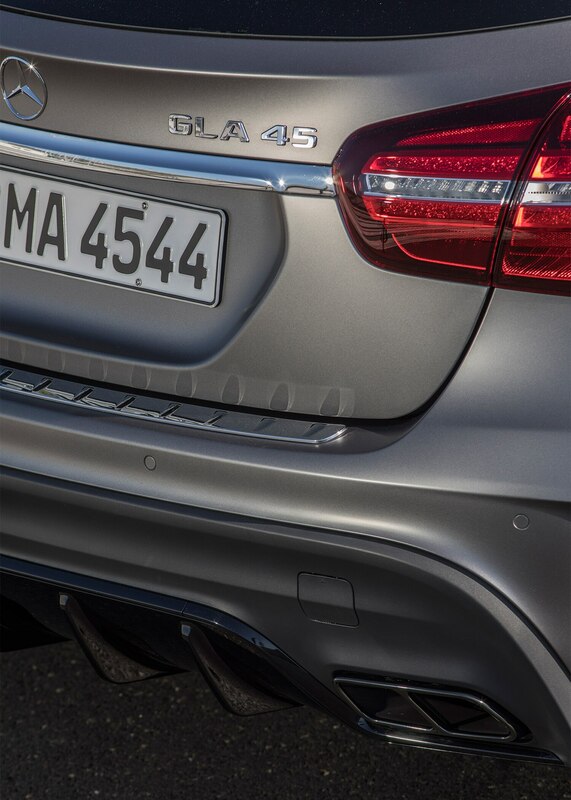 While I’m no Lewis Hamilton, I can say the A45’s handling is fabulous – near neutral and very predictable, and there’s no reason to believe the heavier, slightly taller GLA45 4MATIC would be much different here. 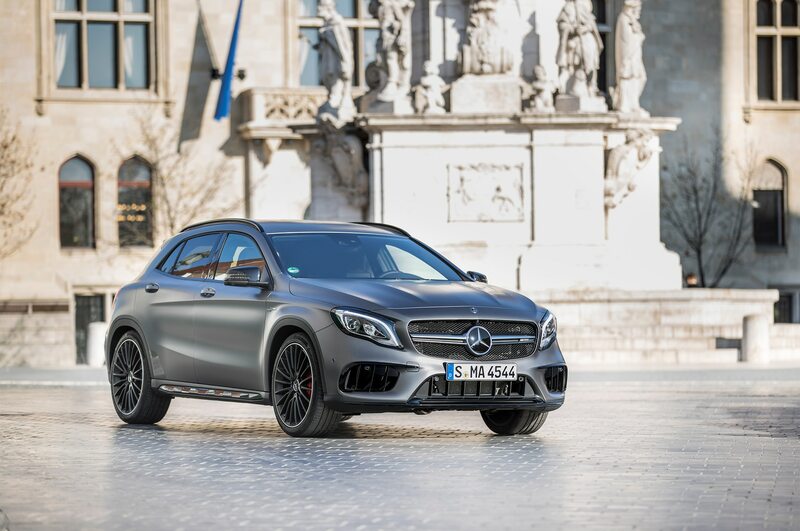 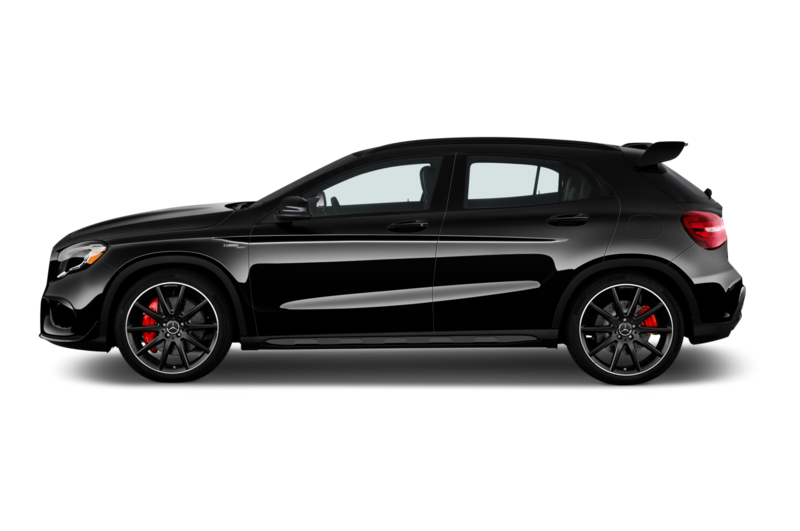 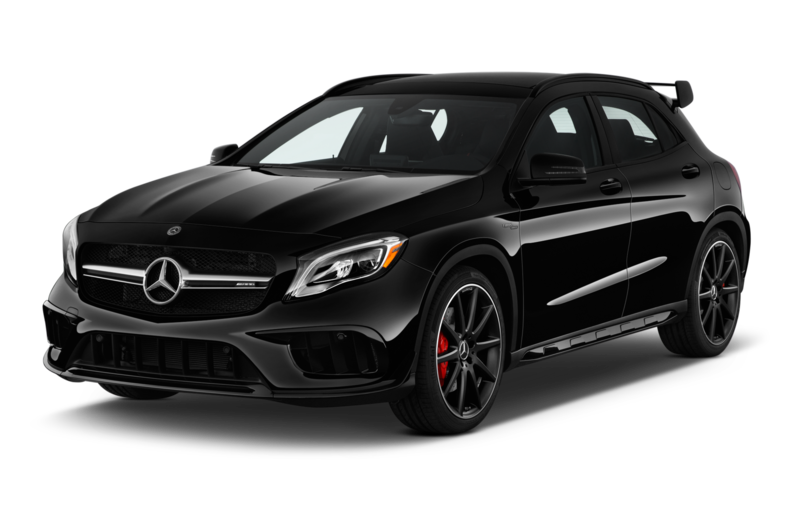 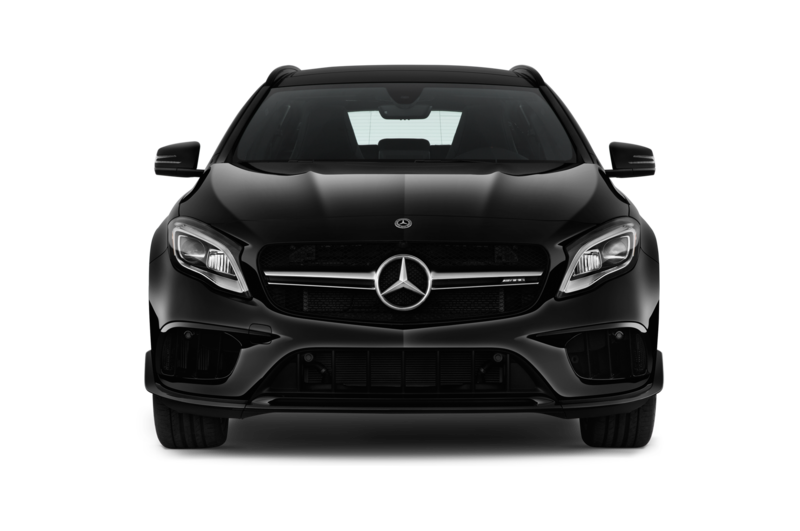 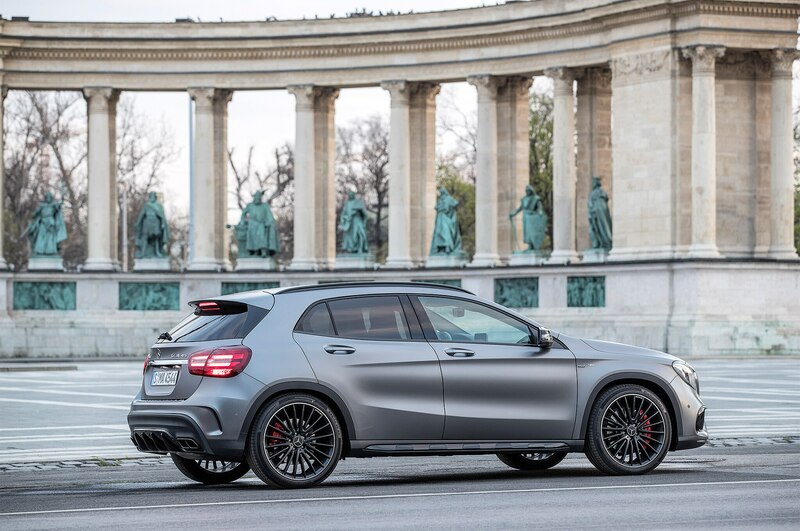 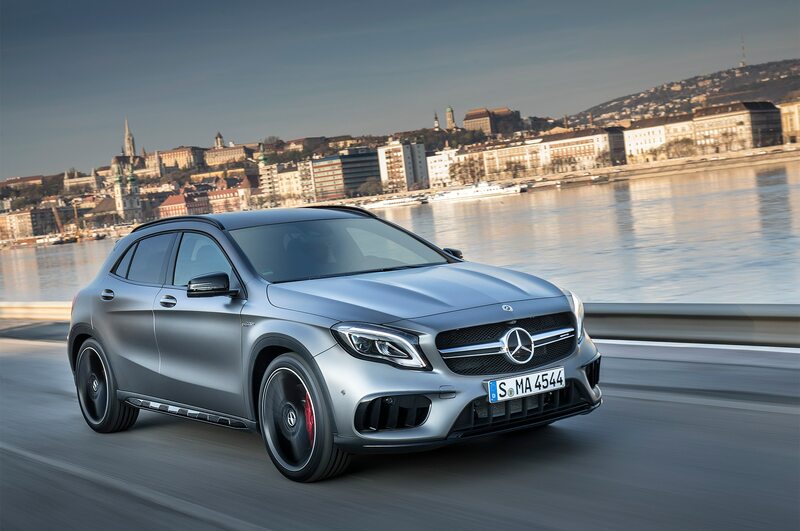 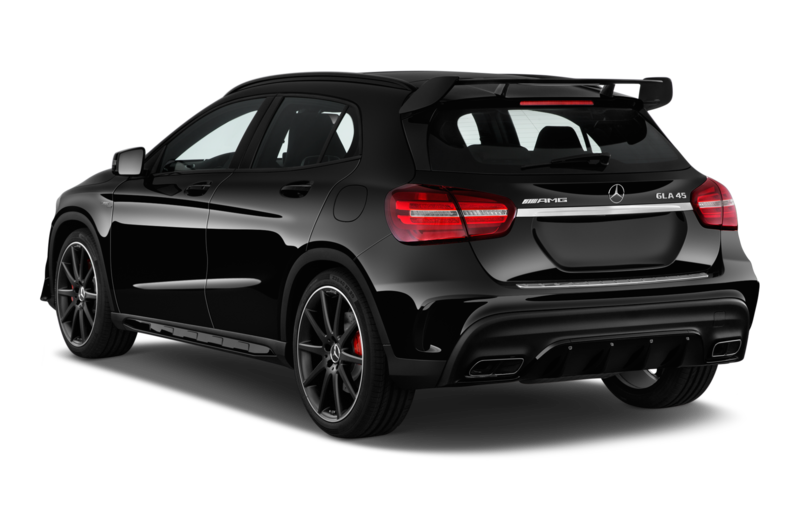 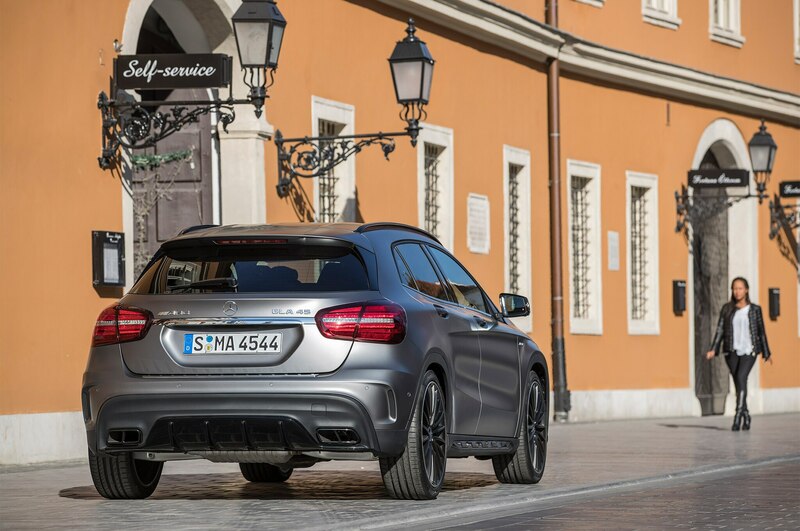 The problem with the Mercedes-AMG GLA45 4MATIC is that even the young, first-time luxury car buyer must ask himself/herself whether this model is more worthy than, say, a nicely equipped C-Class for 50-large. 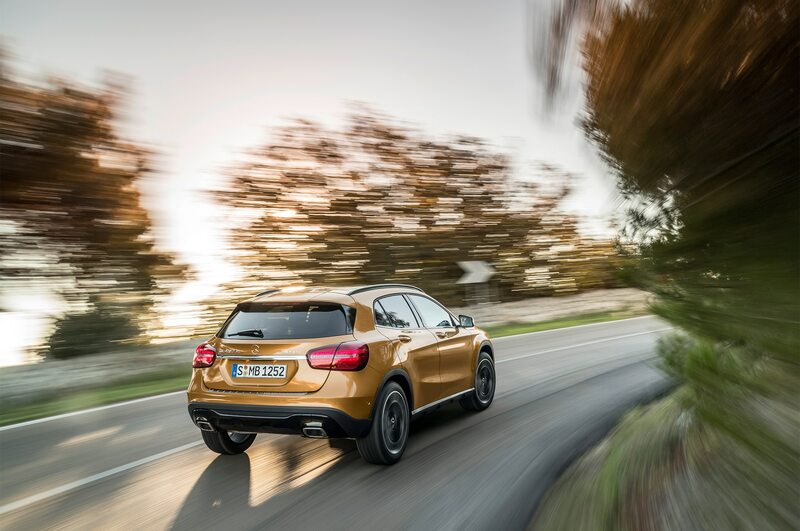 I’m not so sure, though Mercedes-Benz is confident in its compact car-line’s future, with plans to add three models to that five-model global lineup. 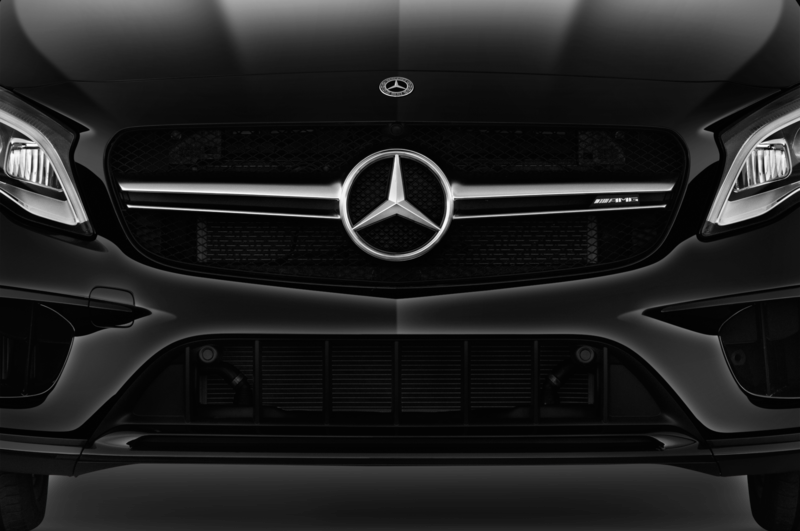 Mercedes plans to add an upright sedan, a better car than the CLA to compete with the Audi A3, in the U.S. by 2019. 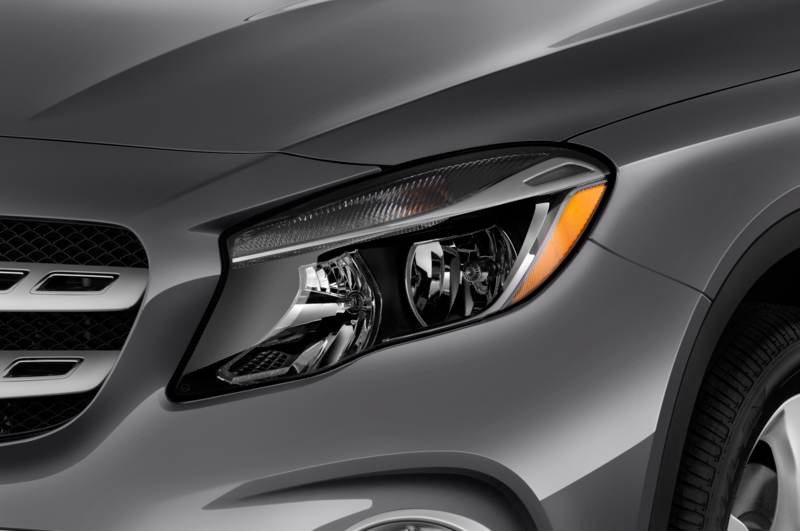 The automaker will show a concept of a new compact at Auto Shanghai 2017 later this month, and it seems likely it will hint at the new sedan. 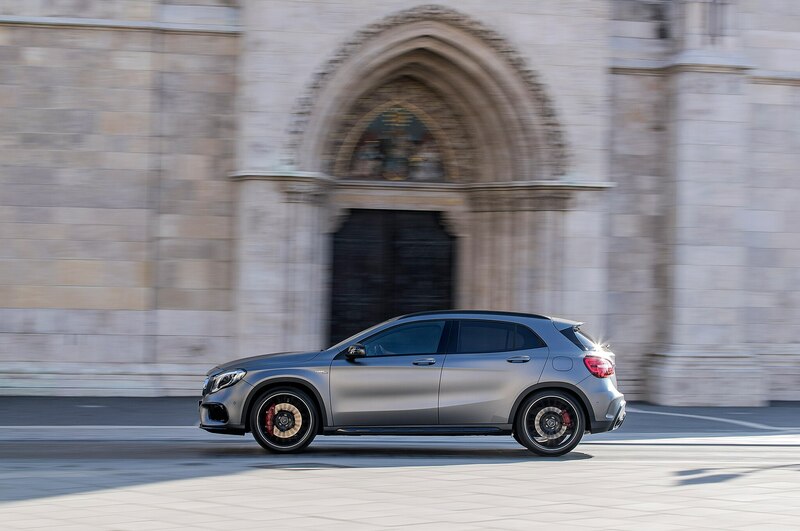 If you’re saving up for your first Mercedes, you’ll be happy to know that unlike its number-one competitor, Benz is working to beef up its entry-premium models.